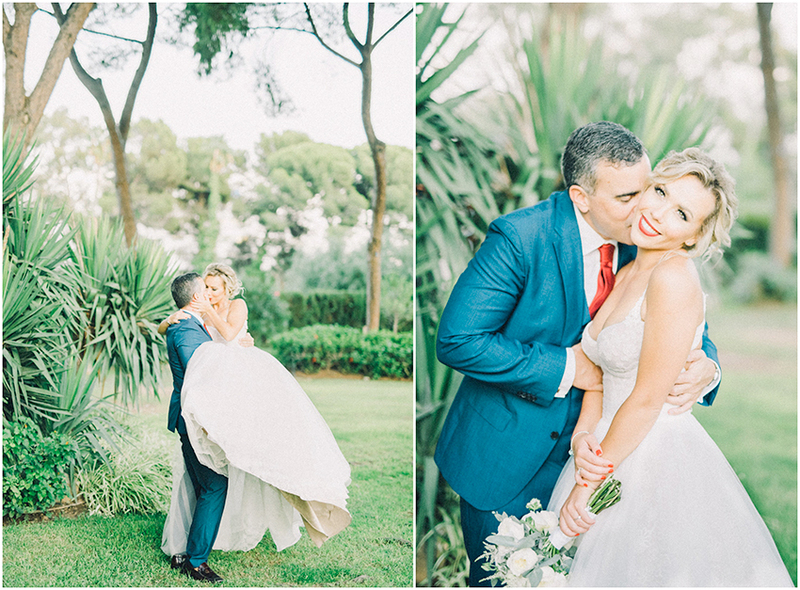 Natalia and Alberto, a Russian-Spanish couple, contacted us a few months ago in order to plan their wedding in Marbella. 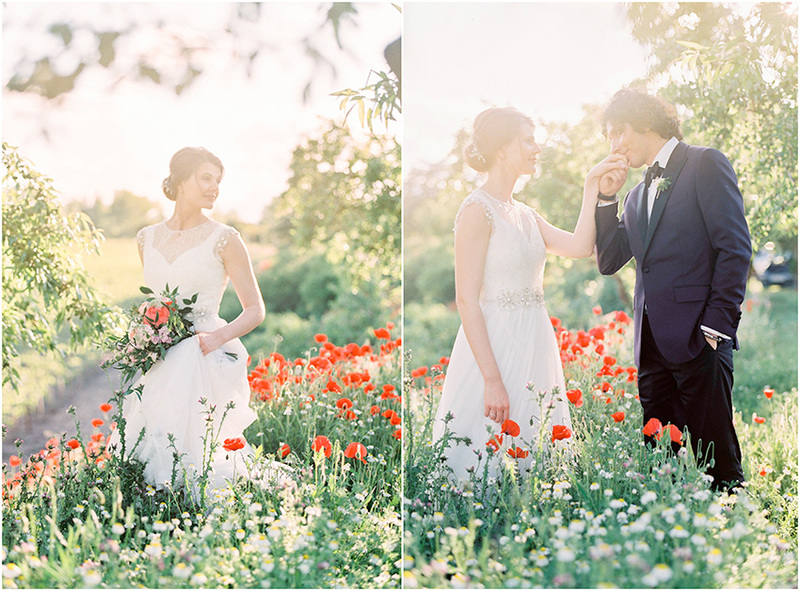 We got to work, and the result couldn’t have been more perfect. 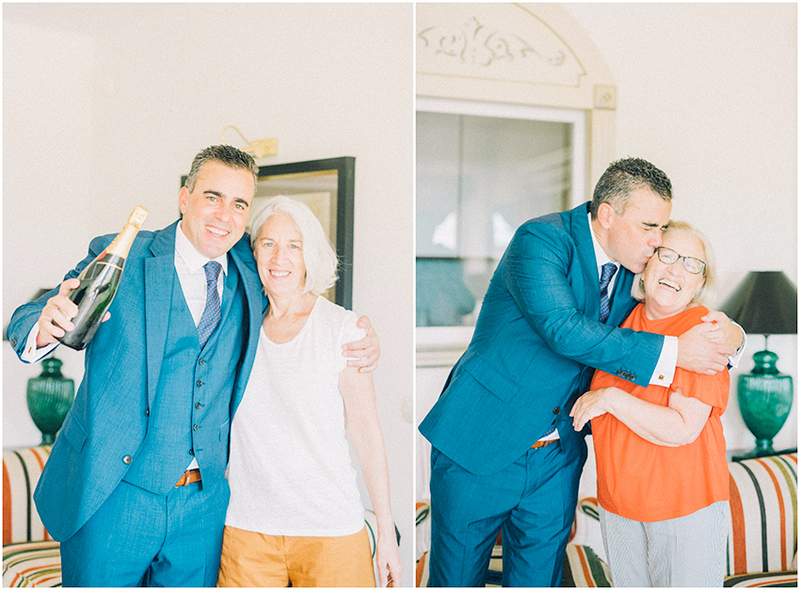 In this article, we’ll give you all the details and share a few of the most special photographs from the big day. 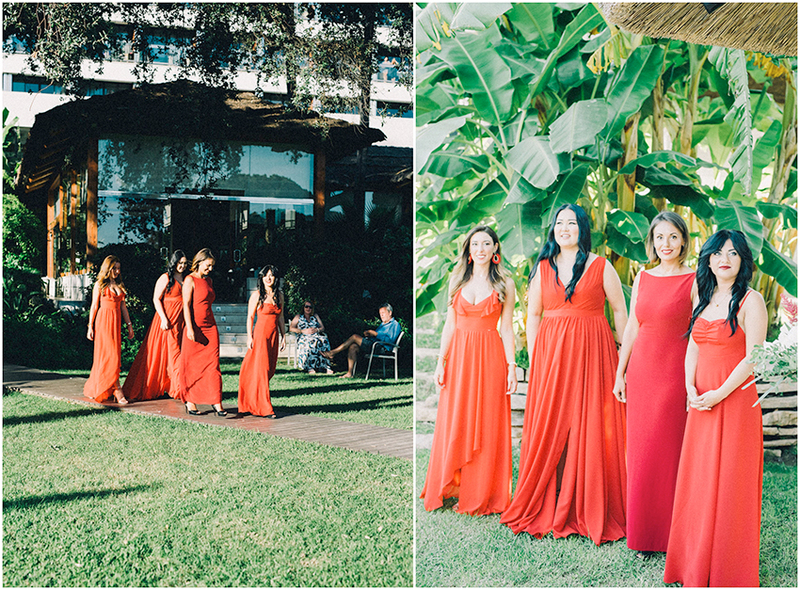 The outdoor ceremony took place in a spectacular hotel in Marbella. 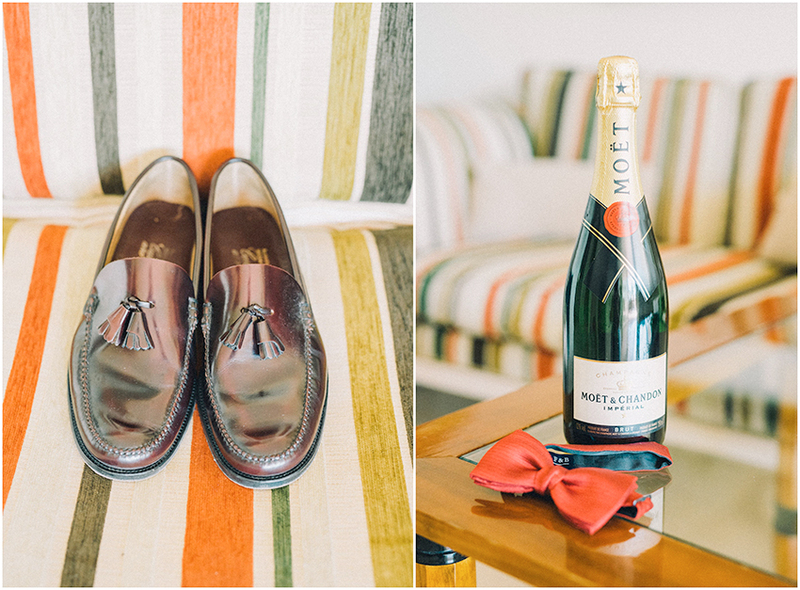 The couple got ready in their separate rooms with their bridesmaids and groomsmen, cherishing the special moments before the couple said “Yes, I do”. 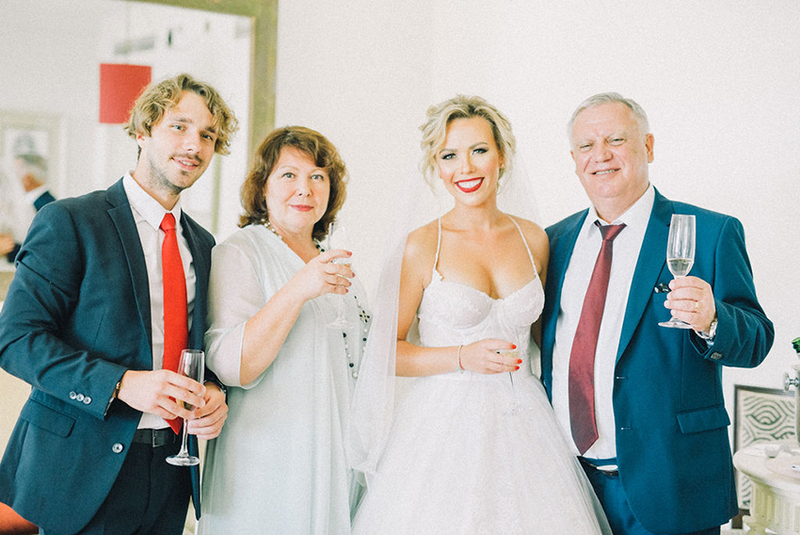 Natalia wore an amazing princess dress with suspenders and pronounced cleavage, and a flattering makeup look with red lips as the main feature. 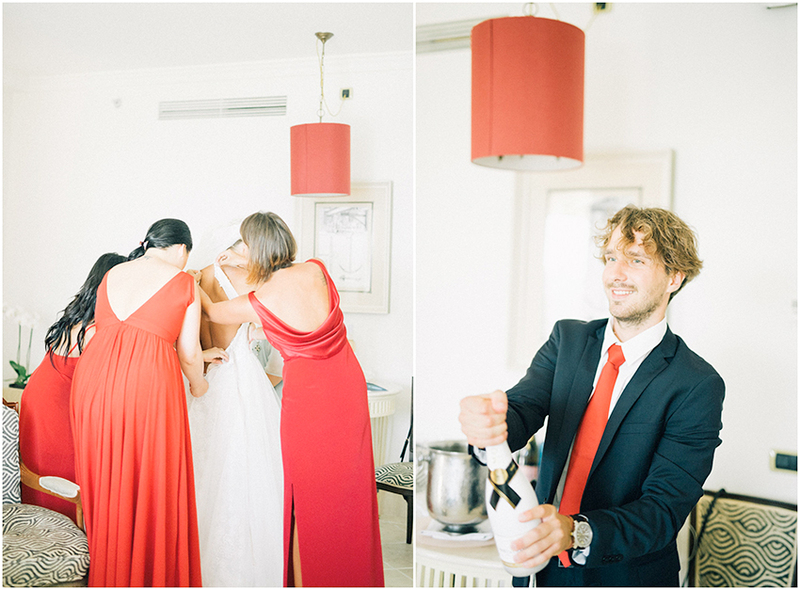 In fact, red was the main colour of the wedding: the bridesmaids wore pretty red dresses, and the groomsmen wore red ties. 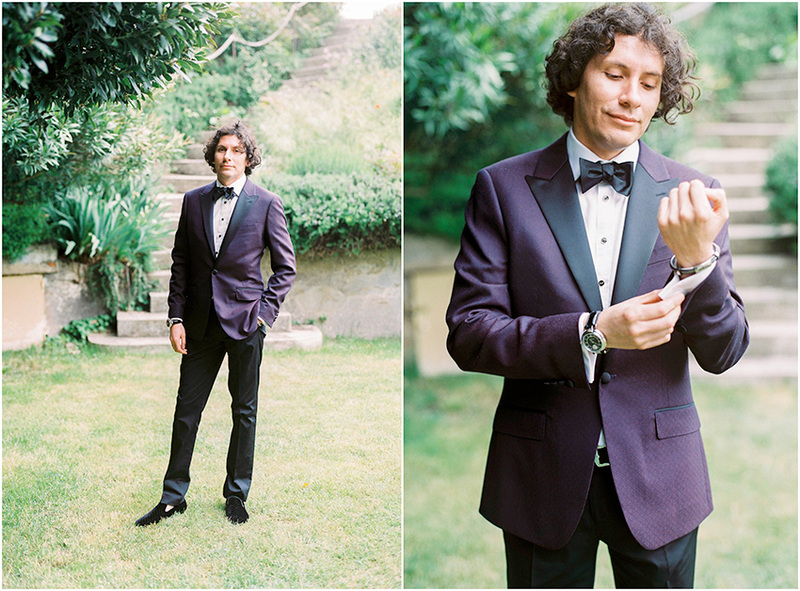 Meanwhile, Alberto wore an elegant blue suit with a white shirt. They were a picture of elegance! 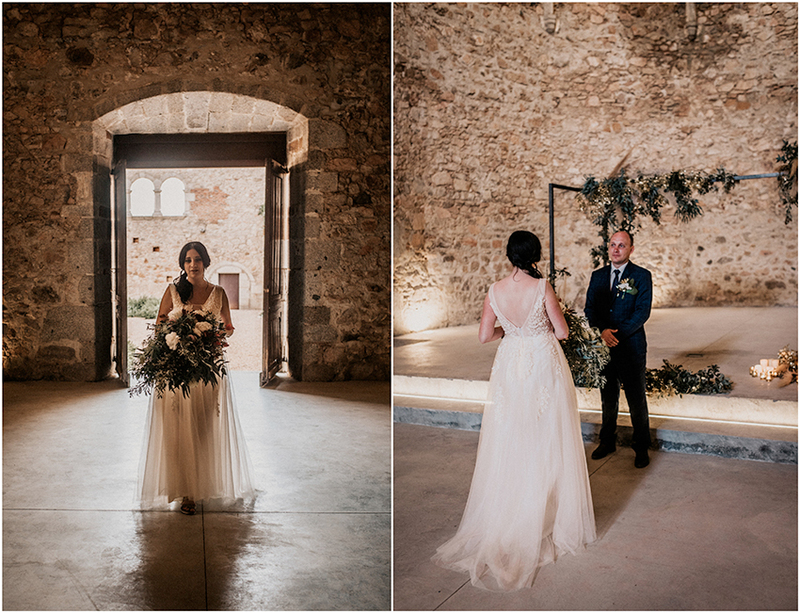 The ceremony was flooded with white, with a beautiful altar decorated with flowers and a large carpet in the hallway. 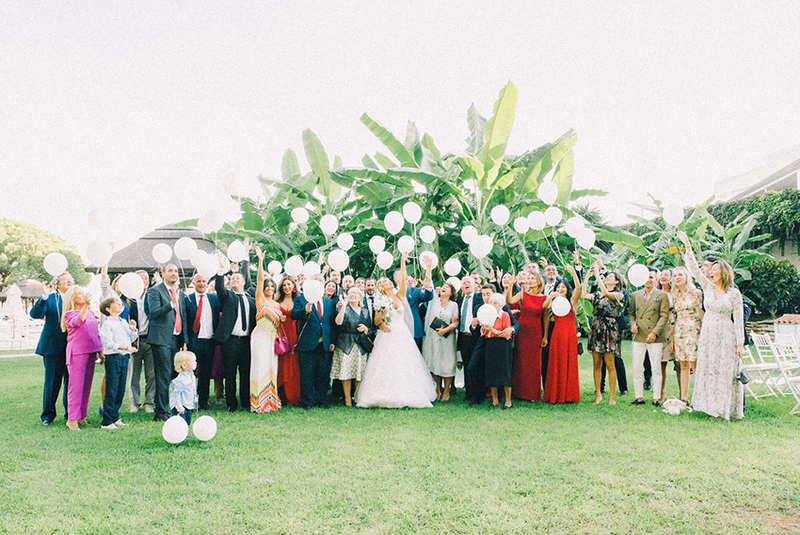 After getting married, both the couple and the guests threw white balloons in the air, which made for some fantastic photographs. 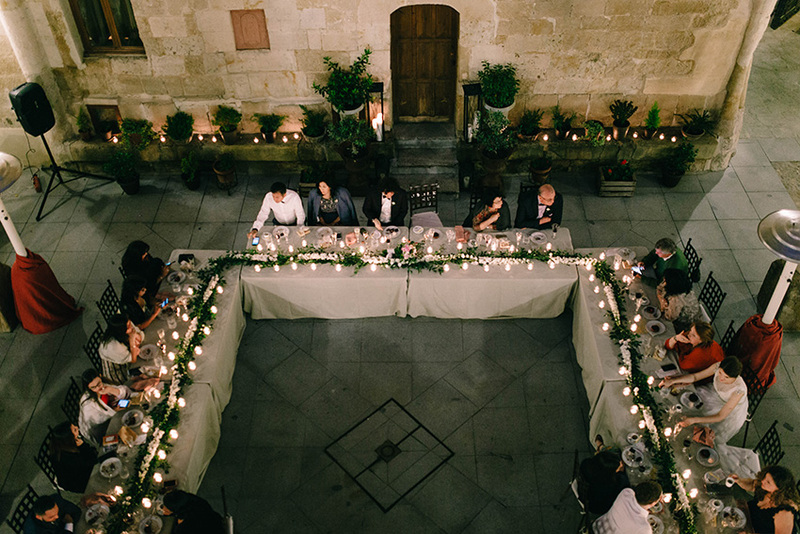 Afterwards, everyone enjoyed an outdoor wedding banquet, thanks to the ideal weather conditions in this exclusive region of Andalucia. 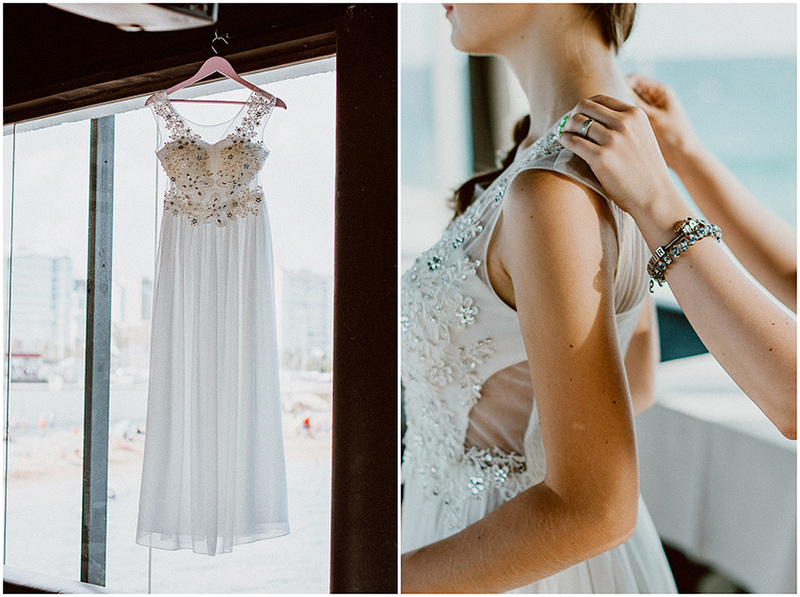 So that she could dance easily, Natalia changed into a short and very comfortable dress…now she was ready to enjoy the whole night! 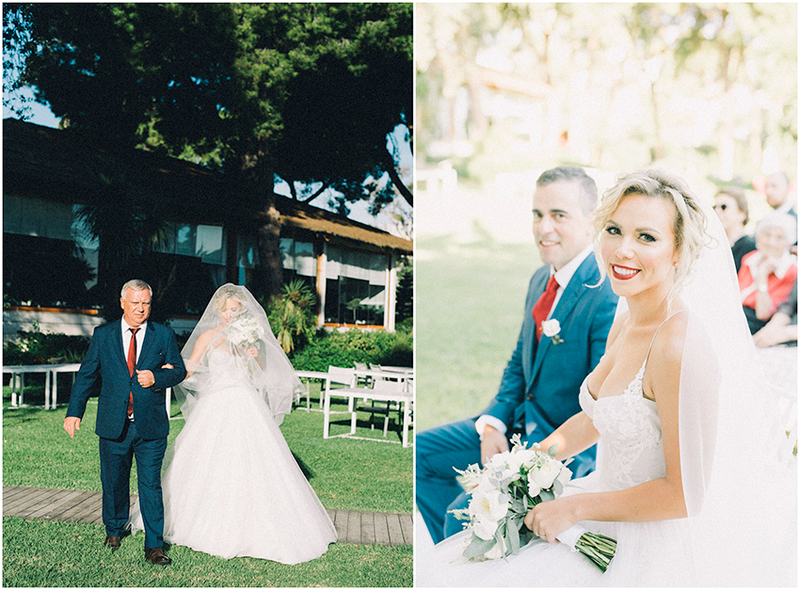 We will leave you with the marvellous photographs of this adorable couple and their wedding in Marbella. Thanks for having faith in us! 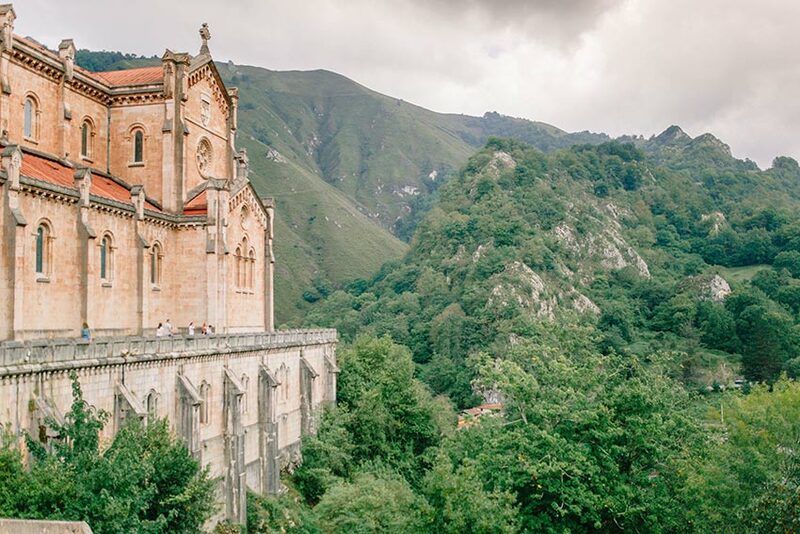 Asturias is a beautiful region located in the North-West of Spain, and it is famous for its beautiful mountains and religious sites, as well as its rocky coastline. The landscape is very green and unspoilt, and the picturesque features of this region make it perfect for a stunning wedding. 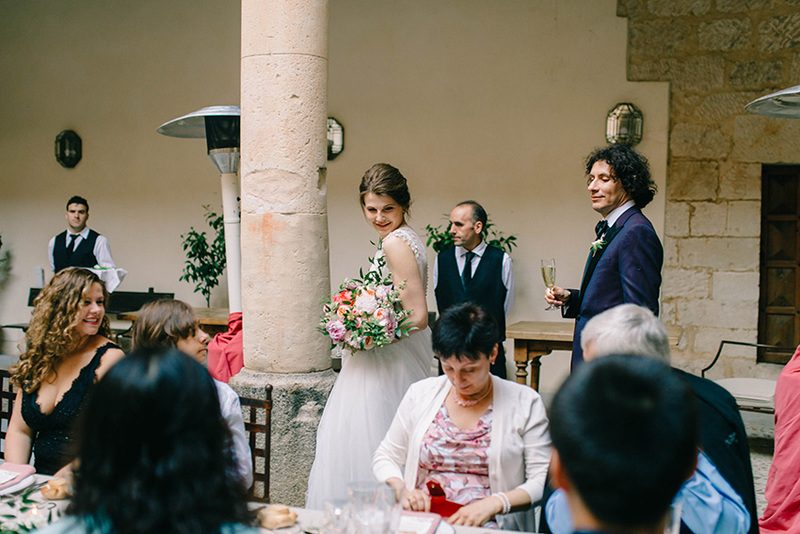 If you have been looking into a wedding in Asturias, you cannot miss this post, as we have put together some reasons for coming here and some of the best venues to choose from for your wedding. Let’s begin! 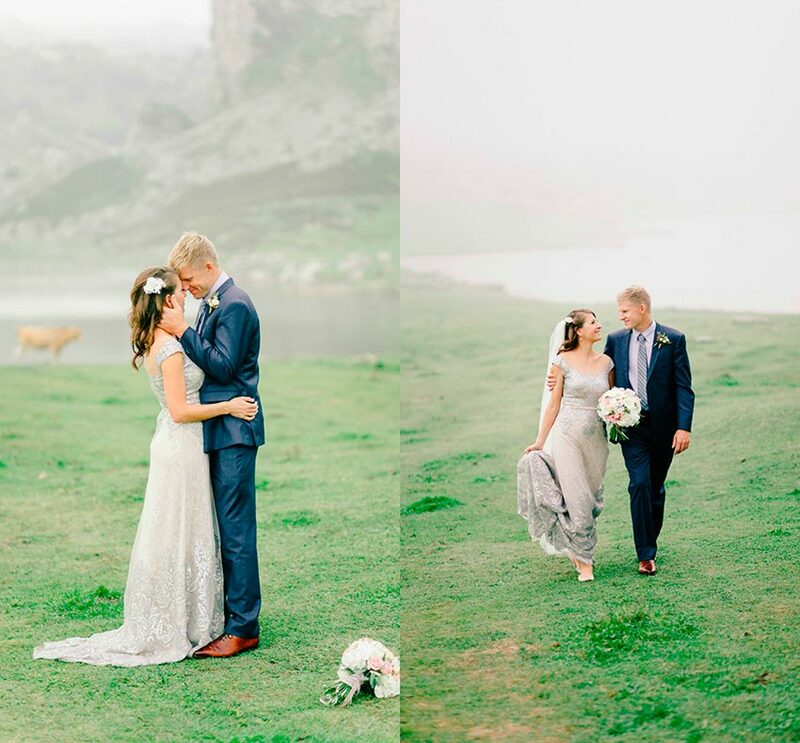 So as briefly mentioned, one of the most important reasons why Asturias is a fabulous location for a wedding is its breathtaking landscapes. 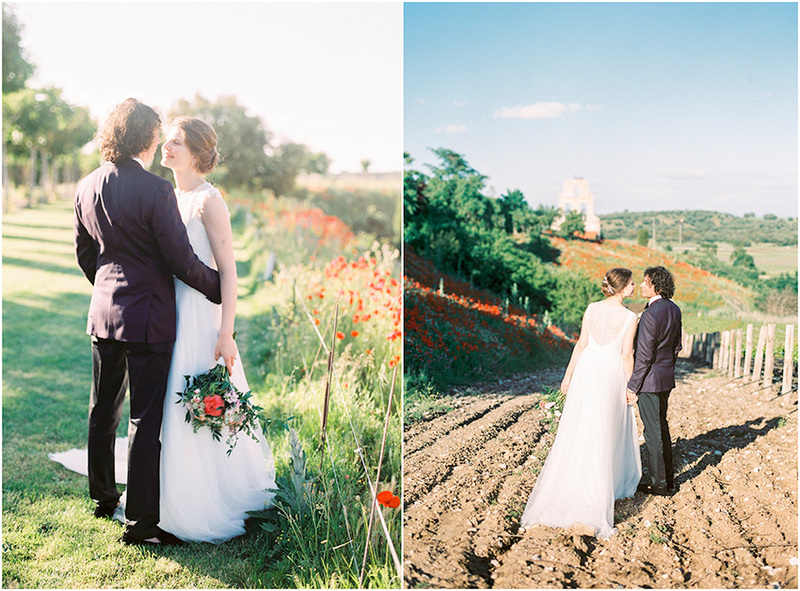 Indeed, it is home to the Picos Europa Mountains, which can provide a wonderful backdrop for your wedding photographs. The mountains are a National Park, filled with nature and characterised with gorges and canyons as well as the mountains. This national park is huge, covering approximately 64000 hectares! 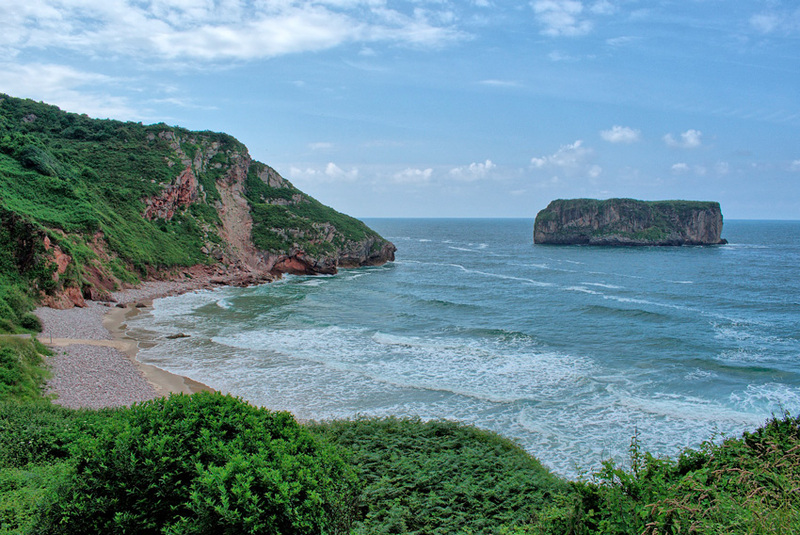 Linking back to the last point, another advantage of the coastline of Asturias is that it allows for the production of fresh seafood, but it is also famous for meat-based dishes and its cheeses, so there is a variety of choice for everyone! The food is that good in Asturias that celebrity chef Jose Andres recommends coming here for the food. 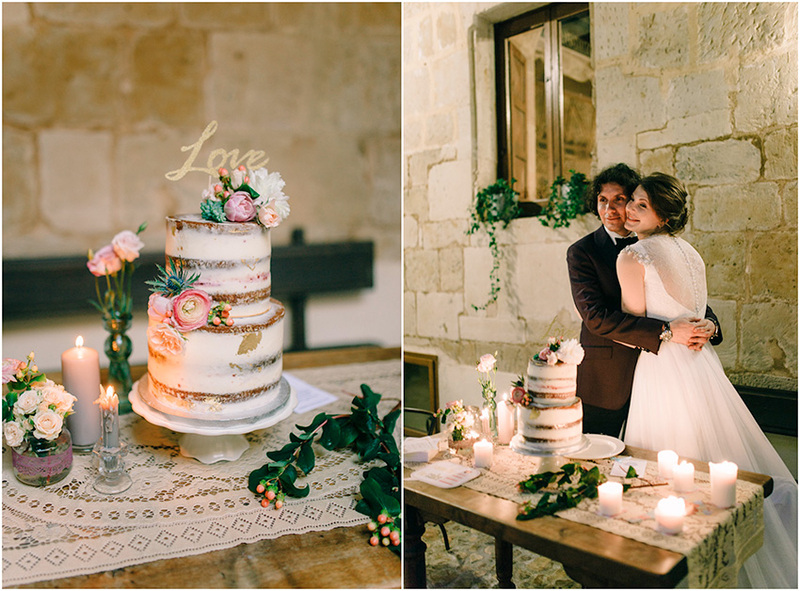 Therefore a wedding in Asturias is perfect is you love food! 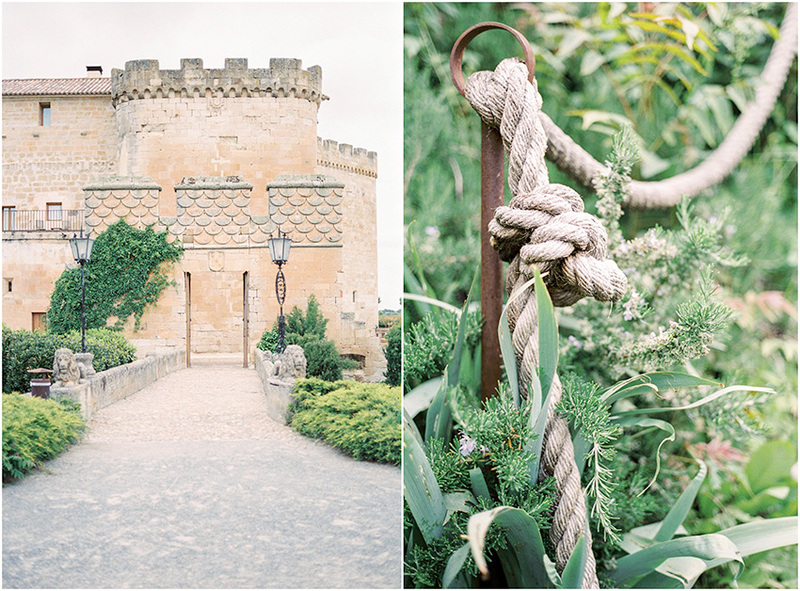 This historic castle is perfect for holding prestigious weddings, as it was home to many Lords and leading figures. 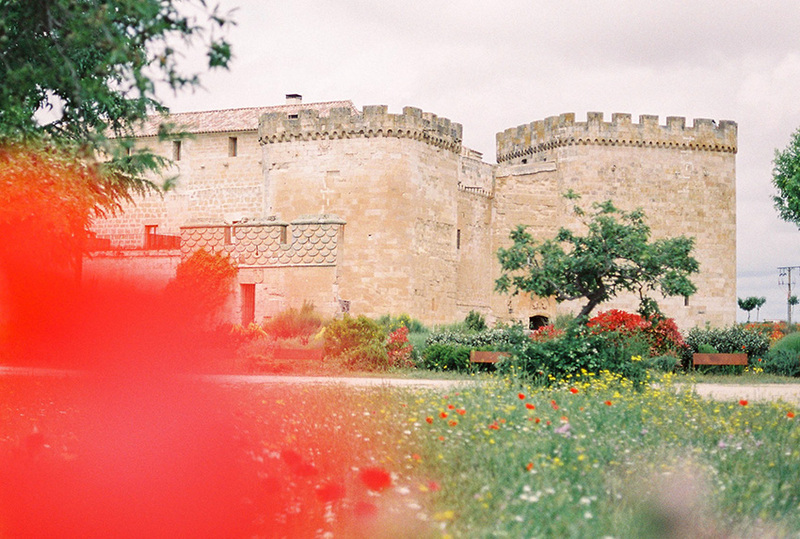 The castle is surrounded by nature and is very tranquil indeed. 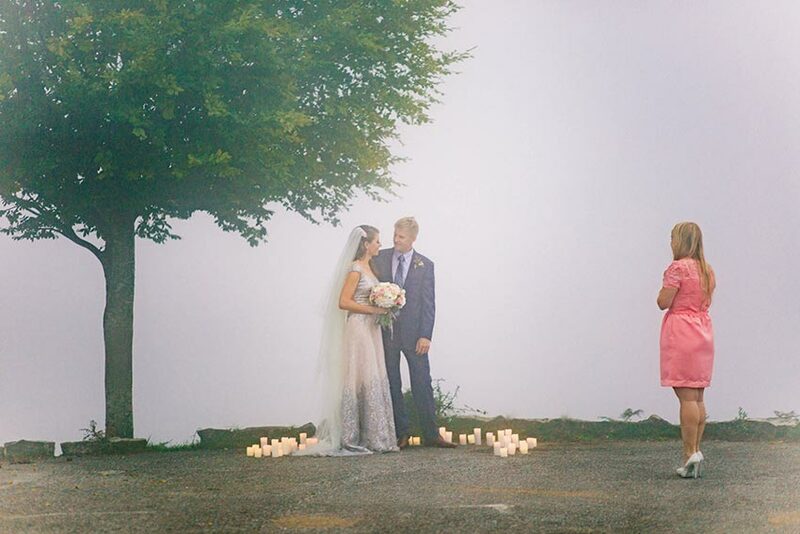 Moreover, you have the option of having either an outdoor or indoor ceremony. Or if the weather doesn’t permit, an indoor ceremony in the castle’s hall. 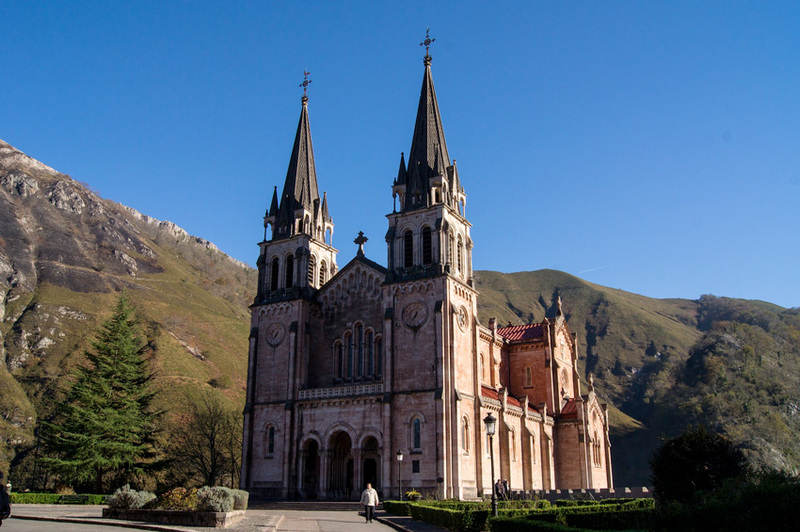 Finally, if you wish to have a religious wedding in Asturias, Sanctario de Covadonga provides you with this. The views are spectacular and the church itself is very ornate – an extremely impressive structure. 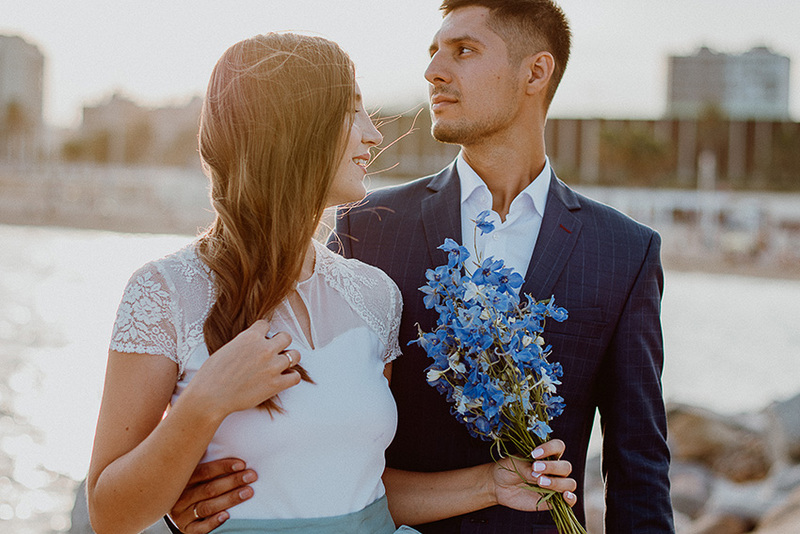 Having a friend officiate your wedding could be a good idea if you want your wedding to have as many personal touches as possible. 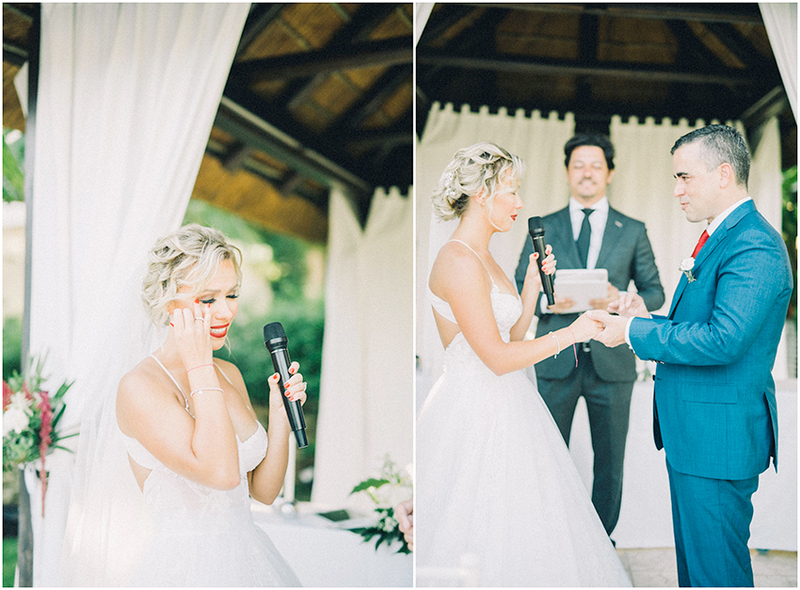 You may also feel more comfortable and less nervous saying your vows in front of a friendly face. 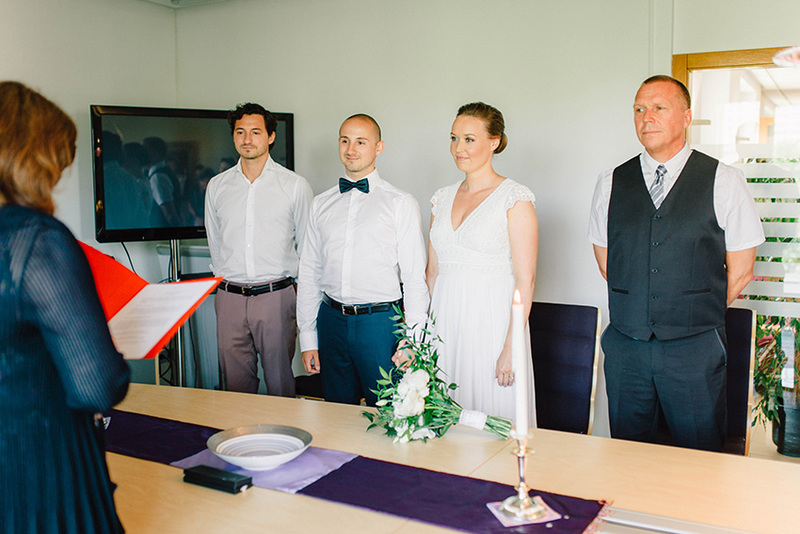 However, if you want your friend to officiate your wedding there are certain things to take into account. 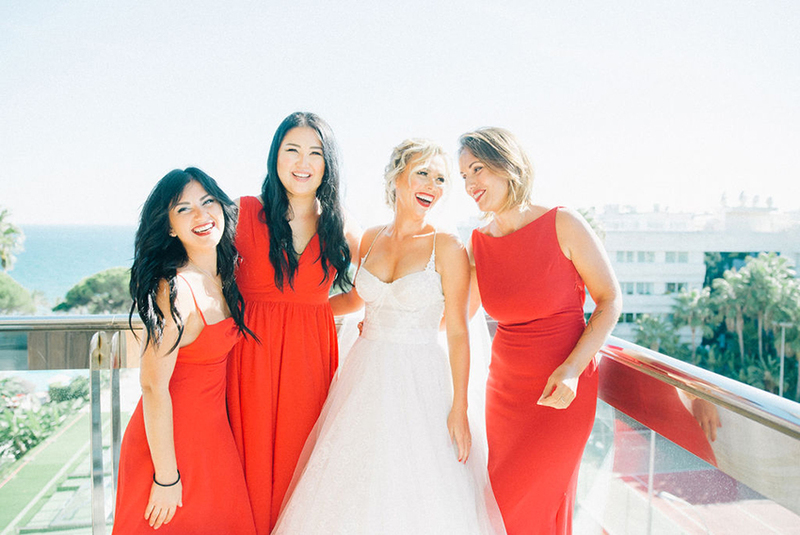 Here we run through each of the most important elements to think about if you want your friend to officiate your wedding – let’s go! 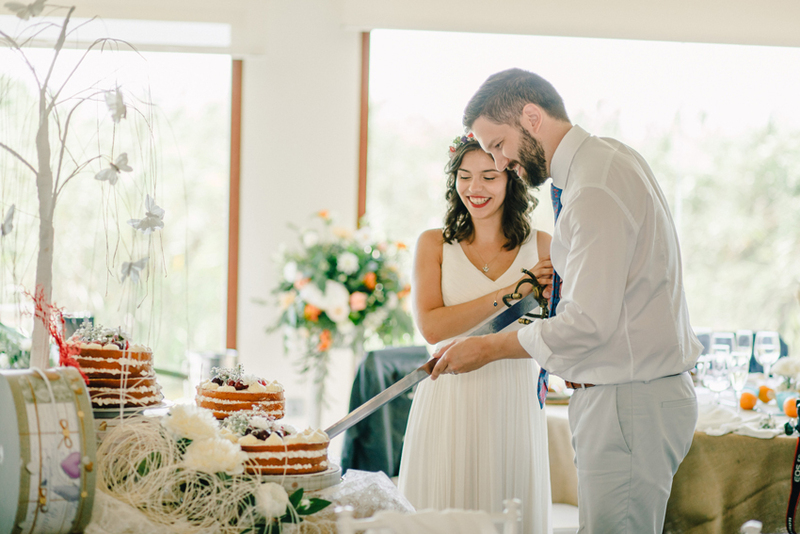 Make sure that both you and your partner agree on who should officiate your wedding. 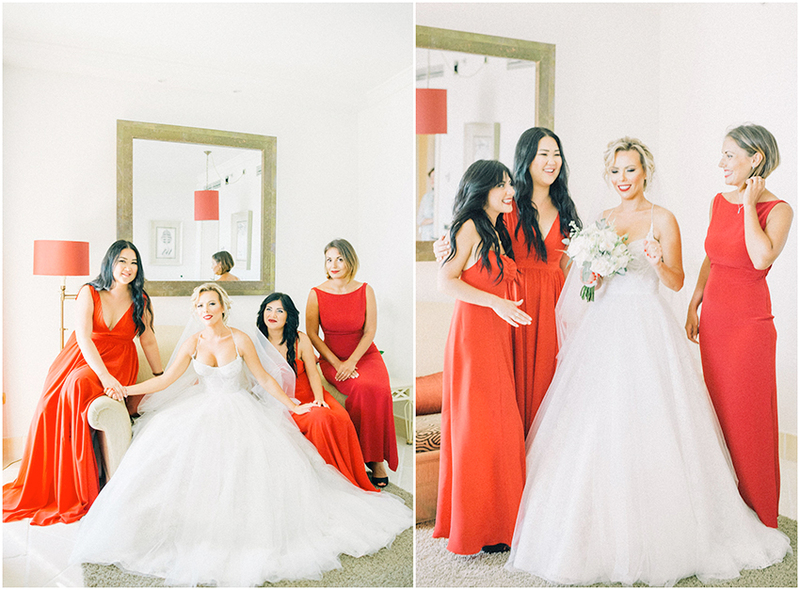 Choosing a friend to officiate your wedding is a good idea if you and your future spouse have the same friends. 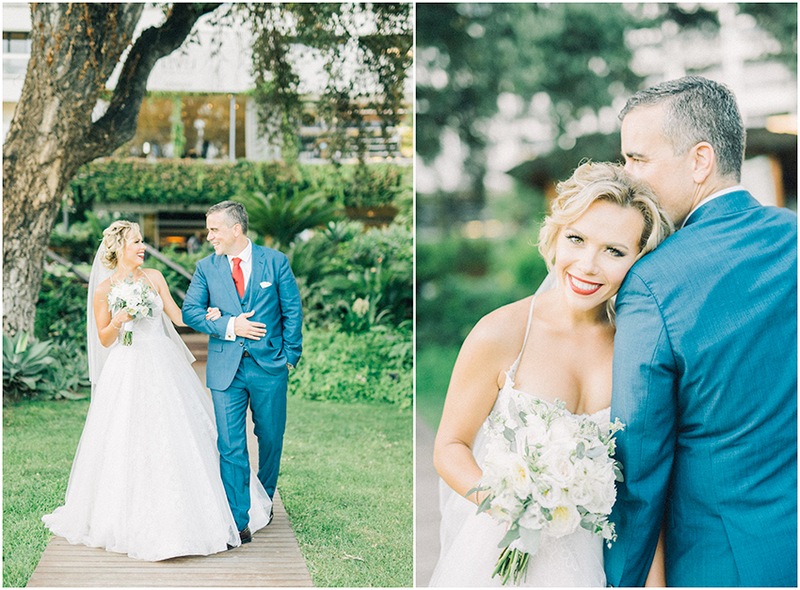 It is important that you are both happy with who you choose to be the officiator, as this is potentially the most important part of the wedding, and it could be difficult to agree if you have different friends! 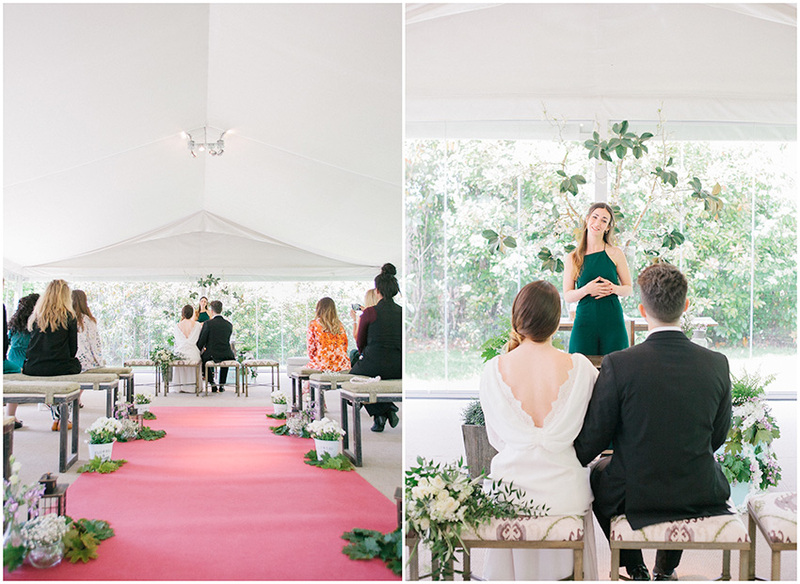 When choosing a friend to officiate your wedding, you need to go back to basics. Ask yourself if they can read well, if they have a clear voice, and if they are a confident public speaker. 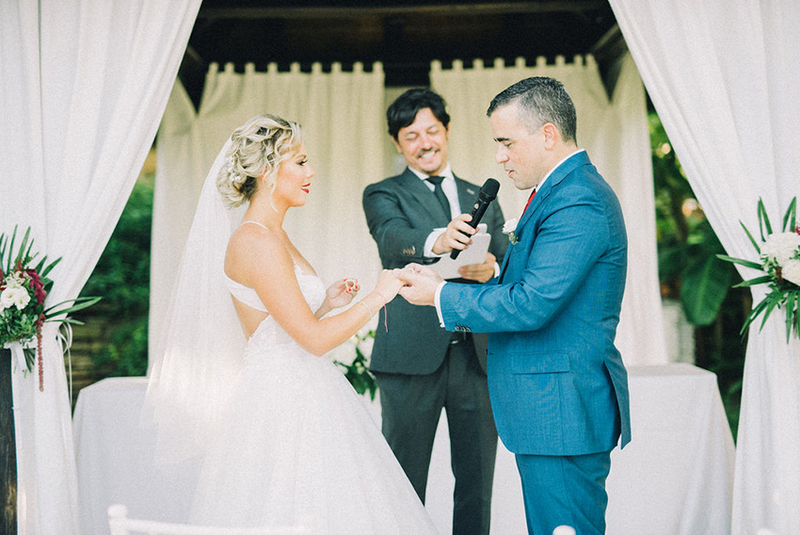 If you want your friend to officiate your wedding, you need to make sure they feel comfortable doing so, and that they will be able to conduct the ceremony to a good standard. 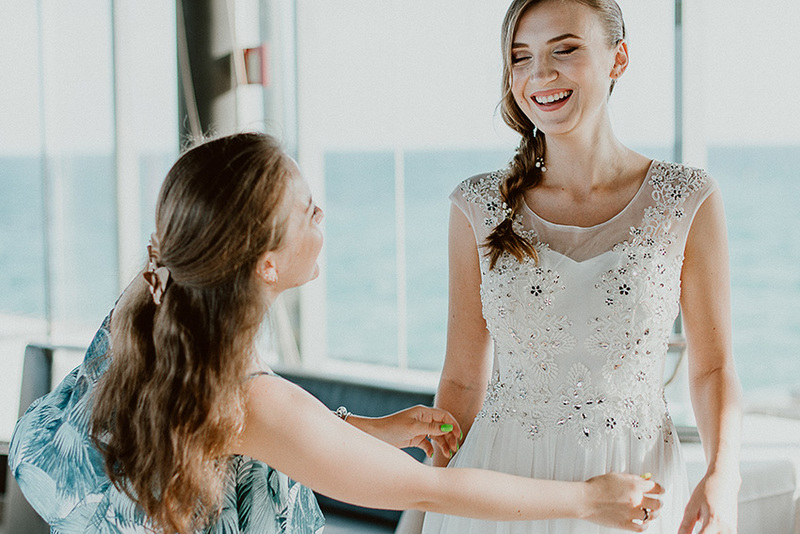 You need to inform your friend how you want the ceremony to be, for example do you want it to be light hearted and funny or more subtle and emotional? You should also tell your friend if you have any ideas or anything you want them to say at your ceremony. As it is your friend officiating the wedding, you will have more opportunities to speak to them and voice how you want it to be. 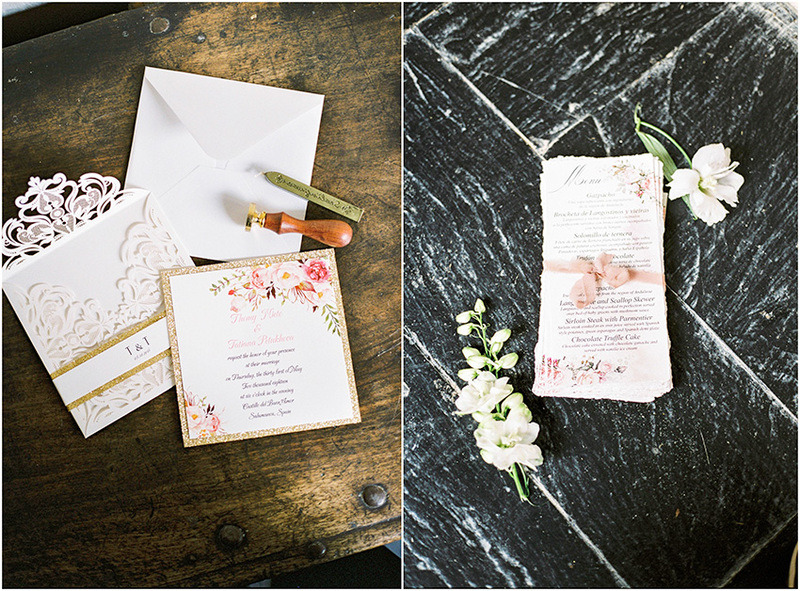 Ensure that they make your wedding personal and to reflect your personalities. 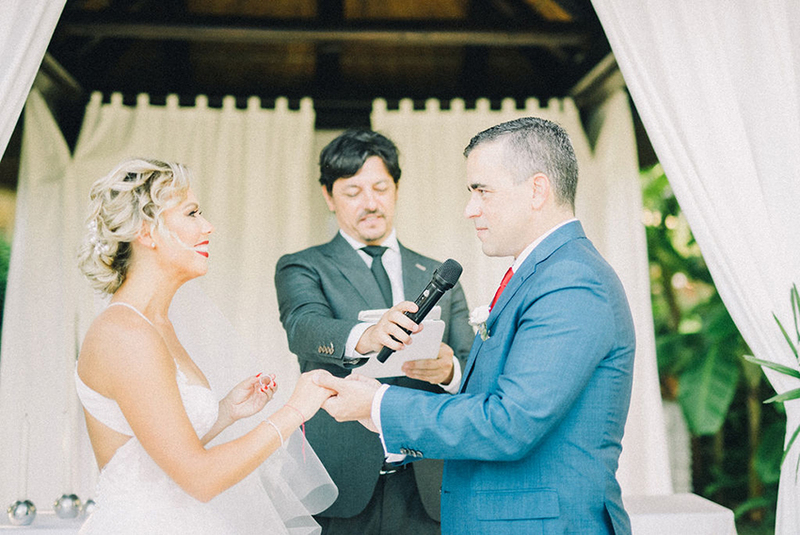 The officiator at the wedding will feature on the photographs of you saying your vows, which could potentially be the ones you treasure the most! 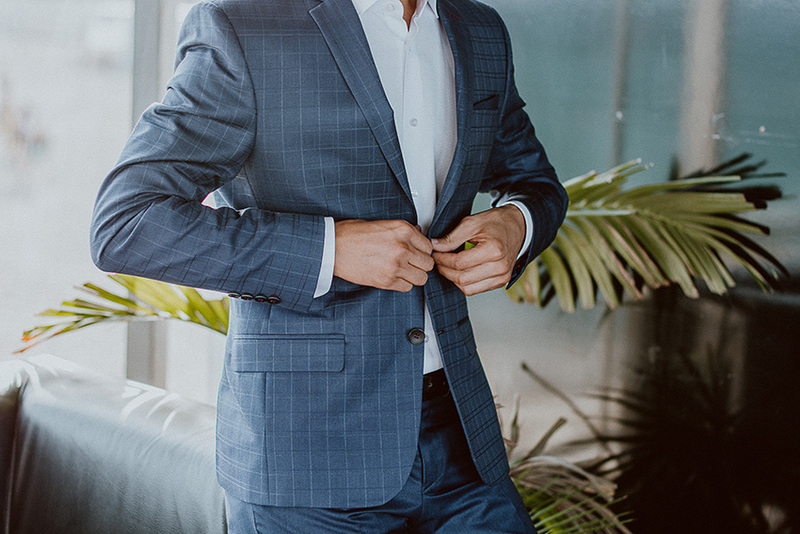 As a result, you should carefully consider what your friend will wear when they officiate your wedding – you will likely want your friend to be comfortable and stylish at the same time. 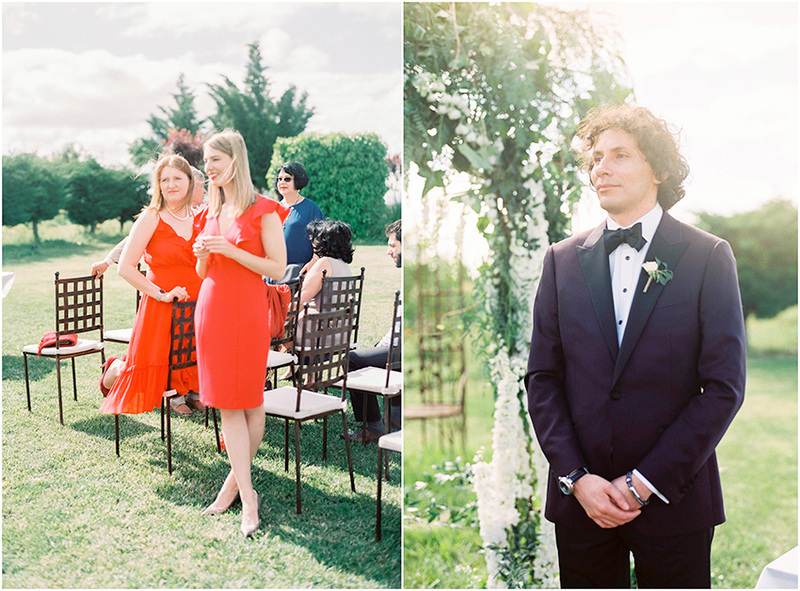 One of the most important things to ensure is that your friend who will officiate your wedding practises what he or she is going to say over and over again. 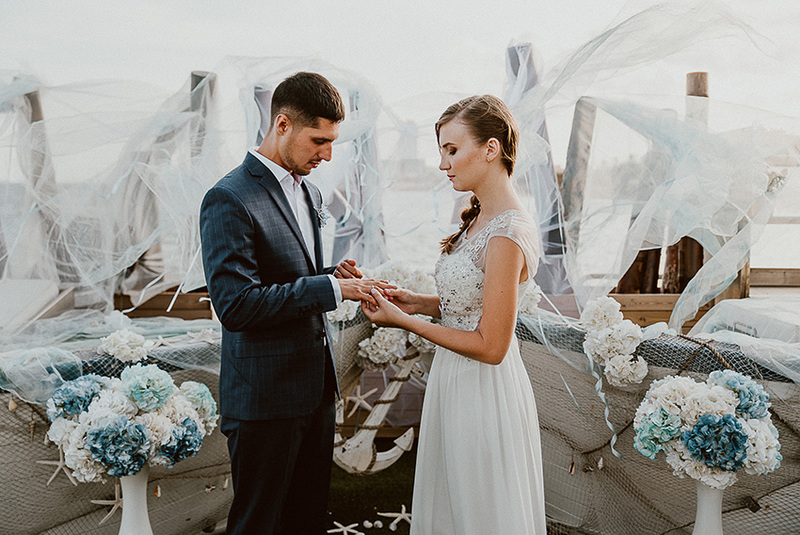 They are unlikely to be a professional officiator, and therefore practice will be key if you want the ceremony to run smoothly! 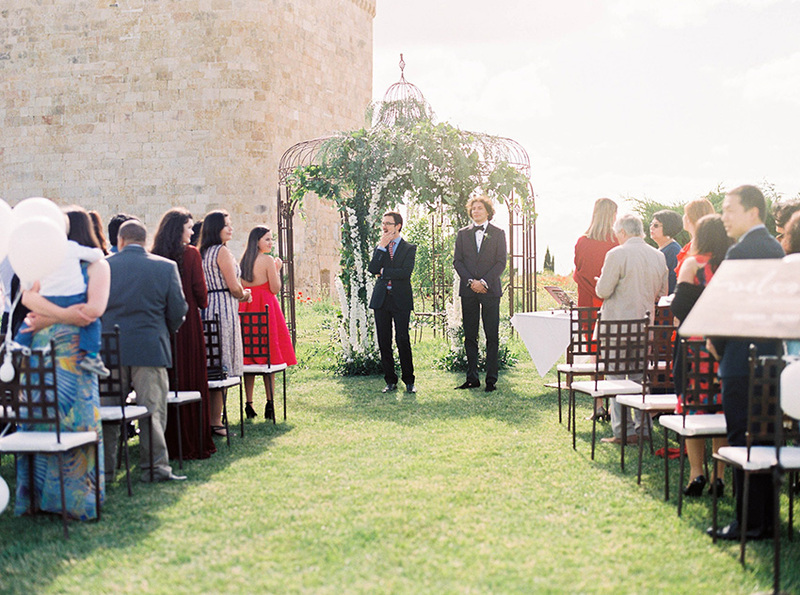 So, here are some things to think about if you’re choosing a friend to officiate your wedding. If you want more information, you can write to us at info@svadbavispanii.ru. 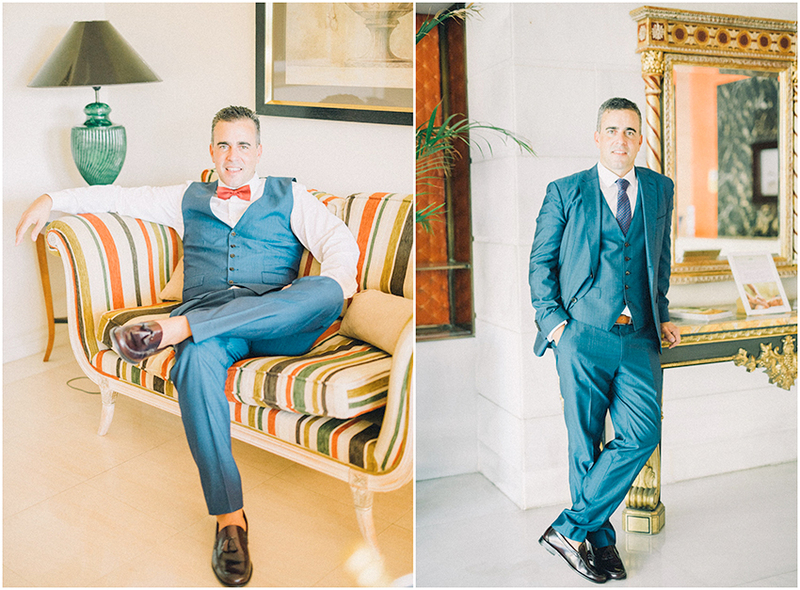 Wedding day coordination is one of the most important parts to make your Big Day a success. 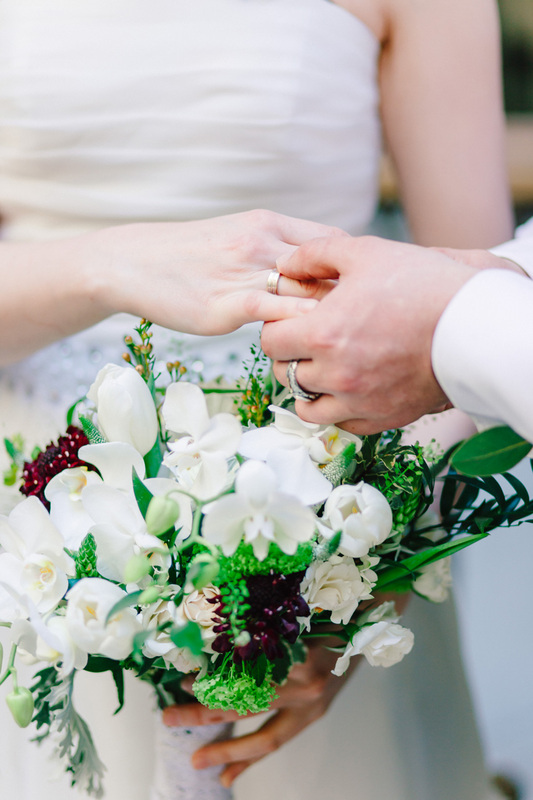 Our wedding planning services include wedding day coordination. 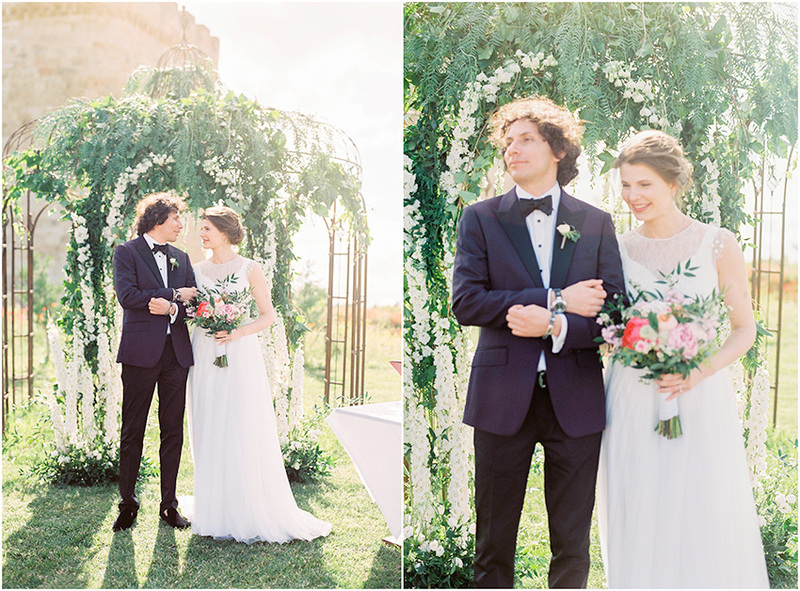 Because of this, you can be sure that your planning and coordination will go hand in hand for a perfect day. 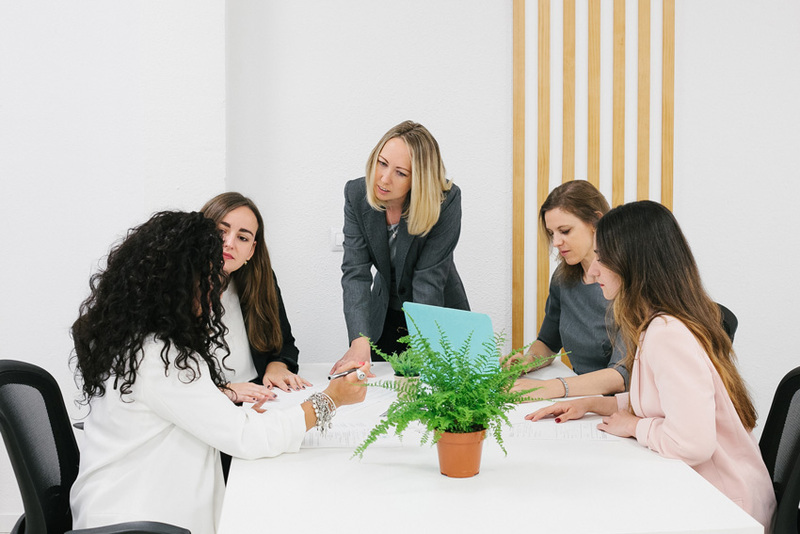 Why are wedding coordinators important? 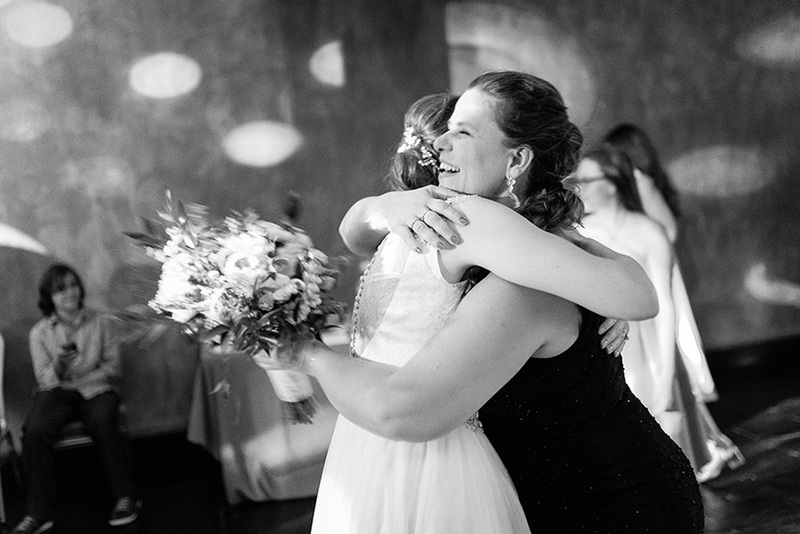 Wedding coordinators are a crucial part of your wedding because they take your stress away. 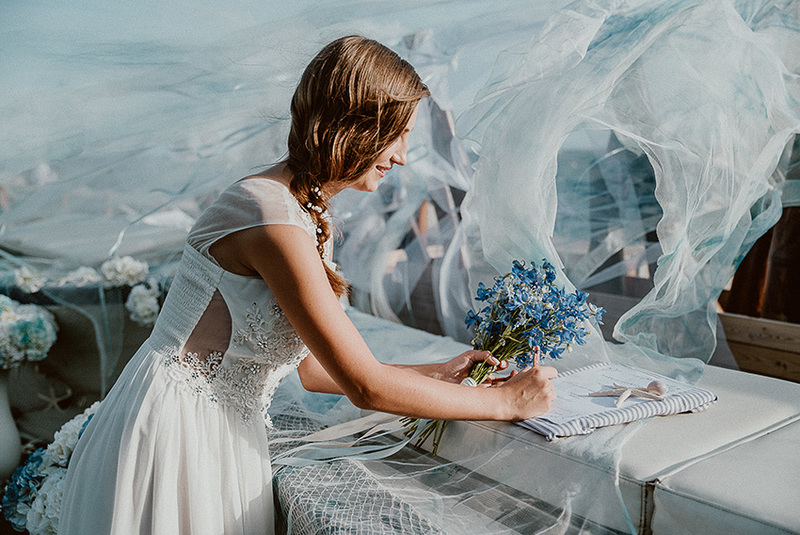 With a wedding coordinator, you can forget last minute panicking because they make sure every detail of your day is perfect. 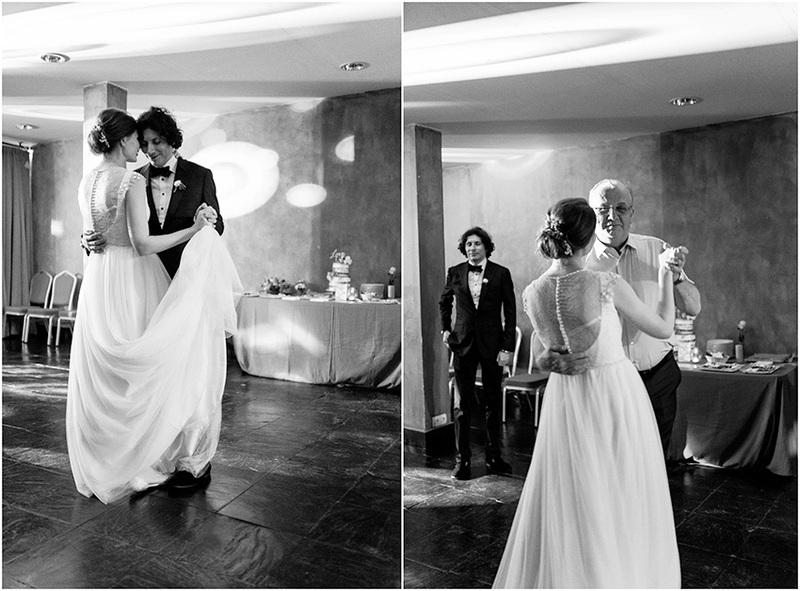 You can simply relax and enjoy your wedding with your loved ones. 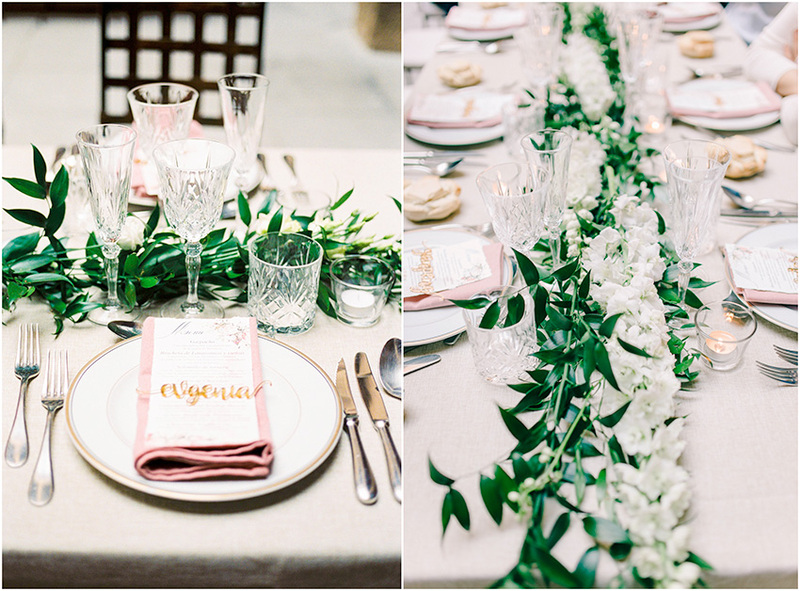 What do wedding coordinators do? They will set your wedding up. They’ll make sure your decorations are in the right place, and the same for the seats. When the time comes for the cocktail reception or banquet, they’ll set this up too. They will ensure that your vendors are ready. They’ll call vendors such as your photographer, DJ and caterers to make sure they’re on their way. They will be the go-to person to answer questions which your guests may have. 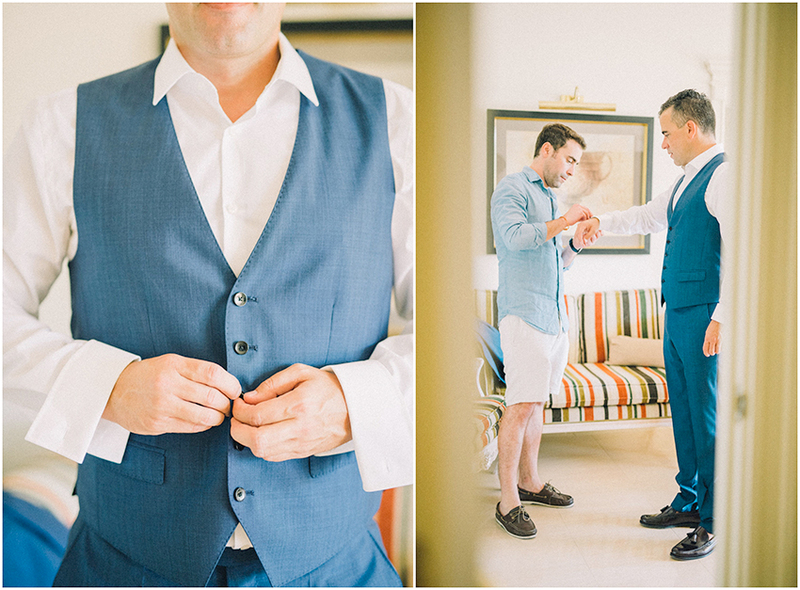 Your coordinator will inform your photographer of when important moments are about to happen. 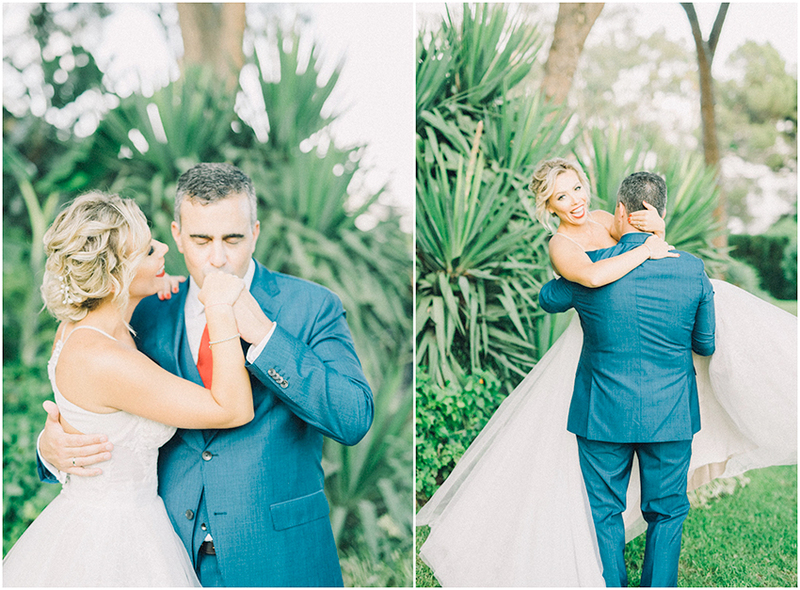 For example, they will tell the photographer when the cake will be cut, or first dance is about to happen so they can capture the most important moments. Finally, they can ensure that your guests are looked after and are behaving well at your reception. Sometimes guests can get carried away if they’ve had a few to drink, so having someone control them can be very helpful. 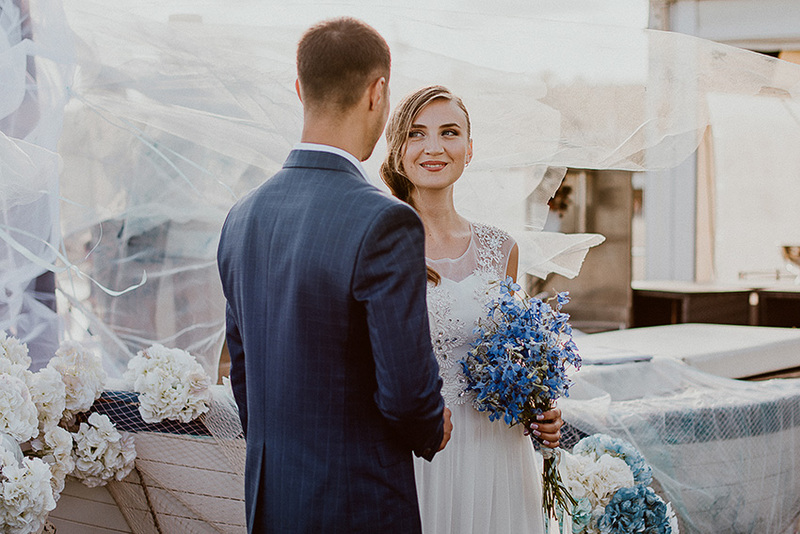 The role of a wedding coordinator is limitless as every wedding is different, but these are the main points. 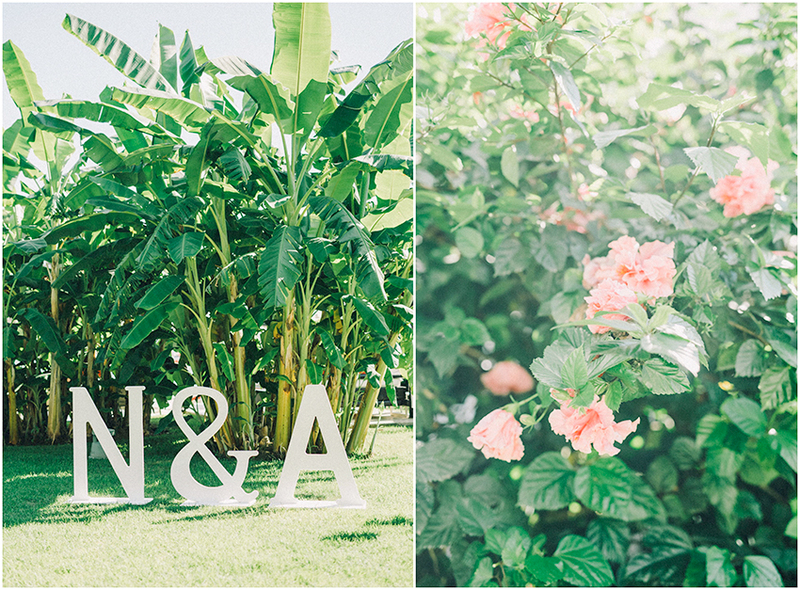 Wedding coordinators are trained to adapt to all kinds of wedding, and they are ready for anything. 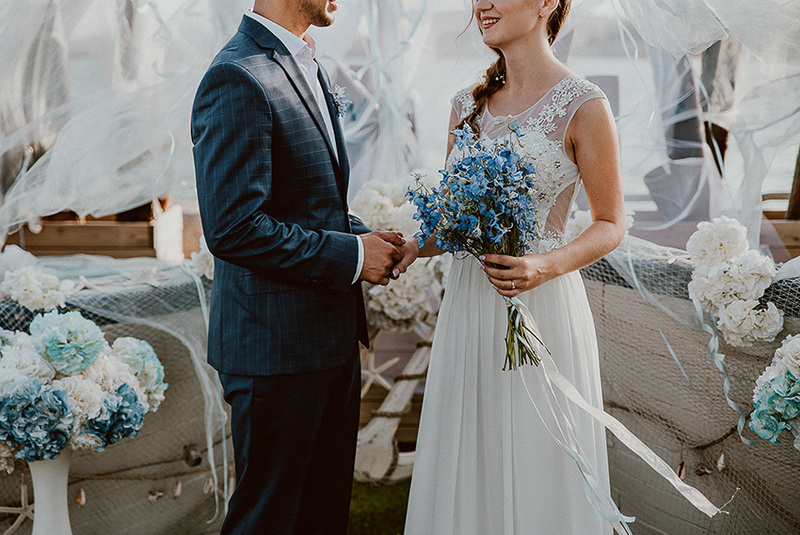 How much does a wedding coordinator cost? This depends on how many wedding coordinators you need. 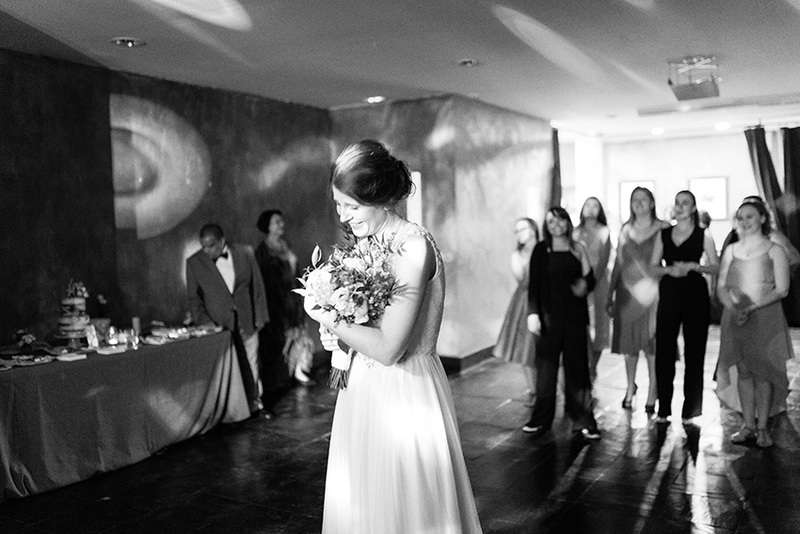 We suggest 1 coordinator per 25 guests to make sure there are enough coordinators for your day to be smooth. 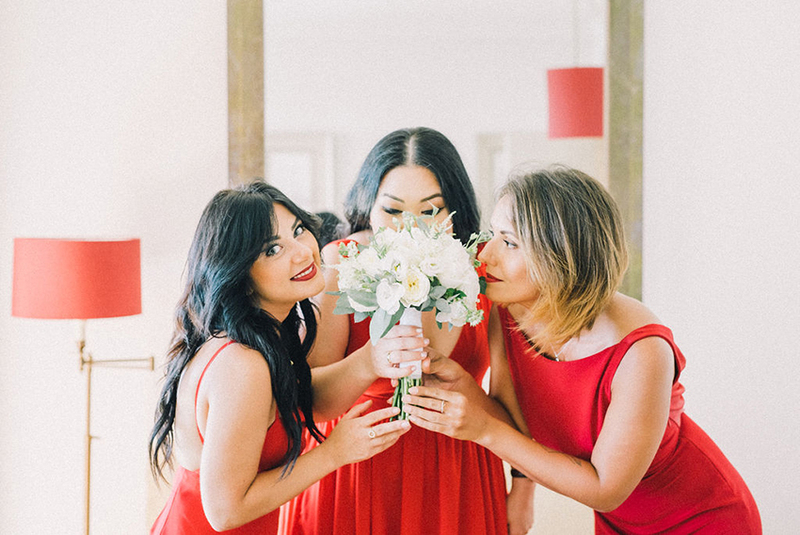 Certain coordinators will look after certain groups of guests, such as the bridesmaids and groomsmen, the couple, and the vendors. The price also depends on the location of your wedding if your coordinator doesn’t work for the venue. 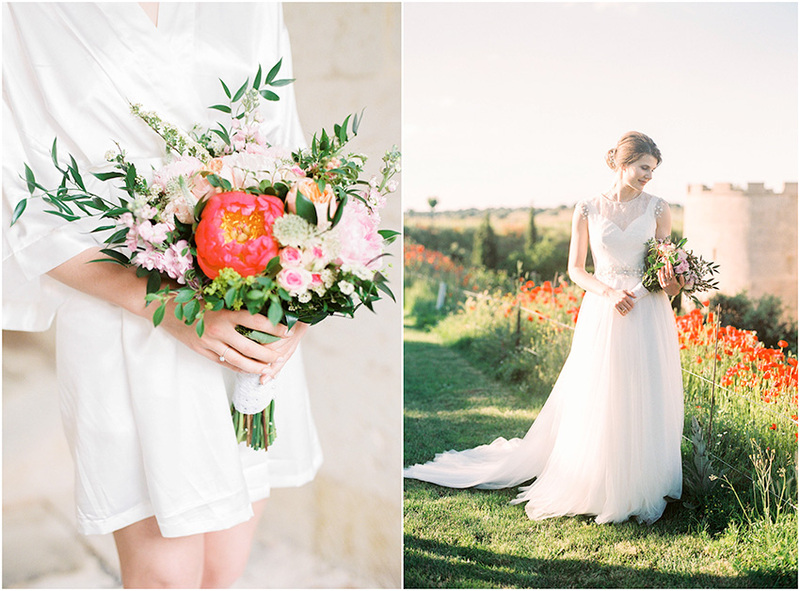 Wedding coordinators are undoubtedly crucial for your Big Day. 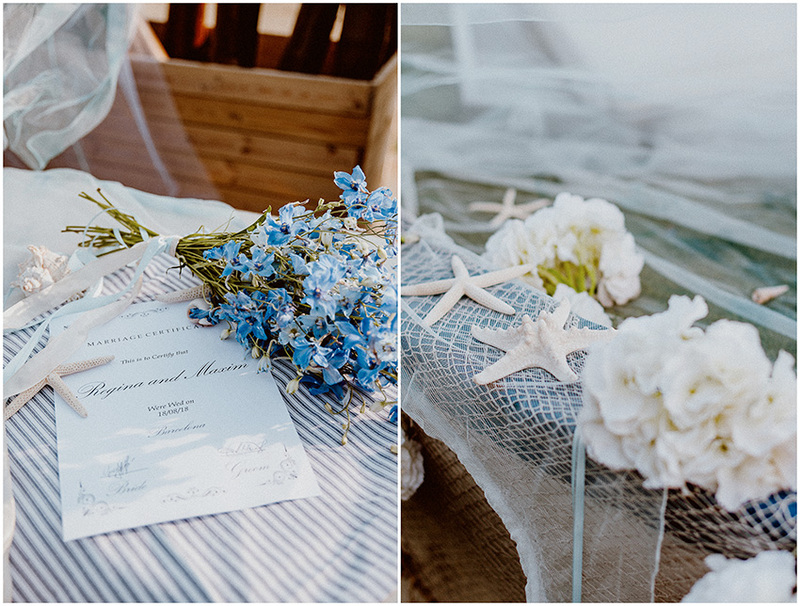 This service comes as part of our wedding planning service, so you can contact us at info@svadbavispanii.ru to team up with us. We look forward to coordinating your wedding! Why have a small wedding? 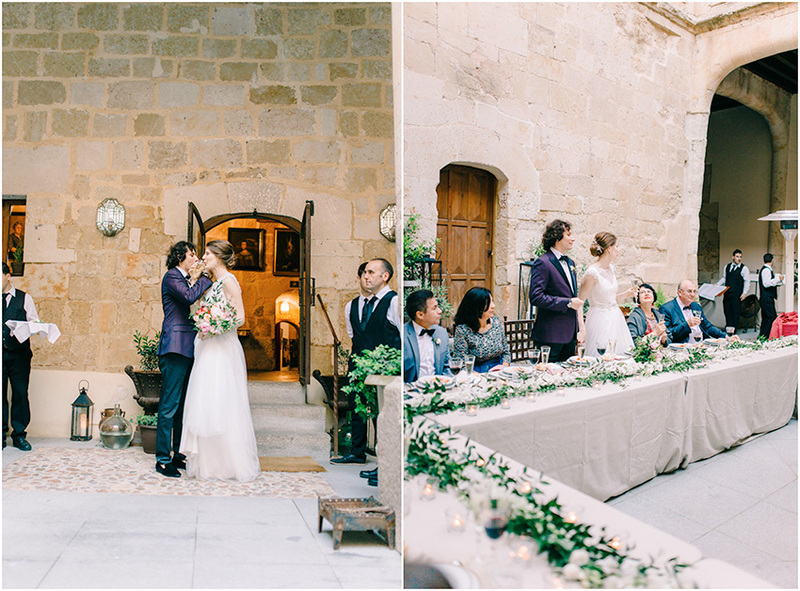 Nowadays, more people opt for a destination wedding in Spain and, as a result, small, intimate weddings are becoming more common. 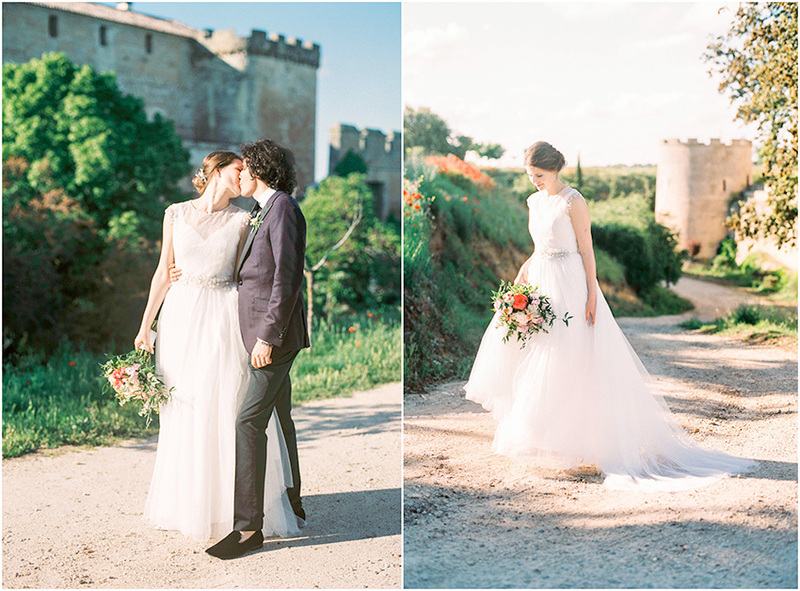 In this article, we go through all the most important advantages of having a small wedding in Spain. Firstly, by having less guests, you have the opportunity to spend more money on the decoration and entertainment areas of your wedding. As a result, your day can be exactly as it is in your dreams. 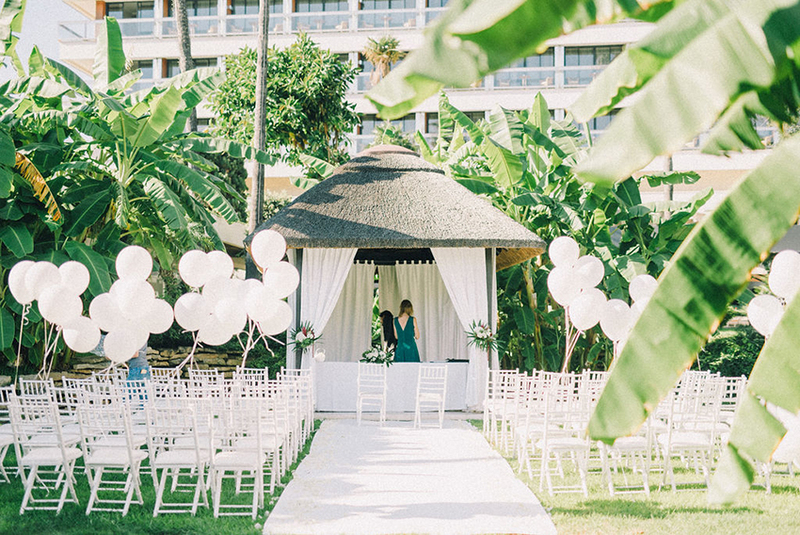 This in turn will make your wedding more memorable for your guests, as well as yourselves, as you can have a small, more luxurious wedding for the price of a basic wedding with hundreds of guests. 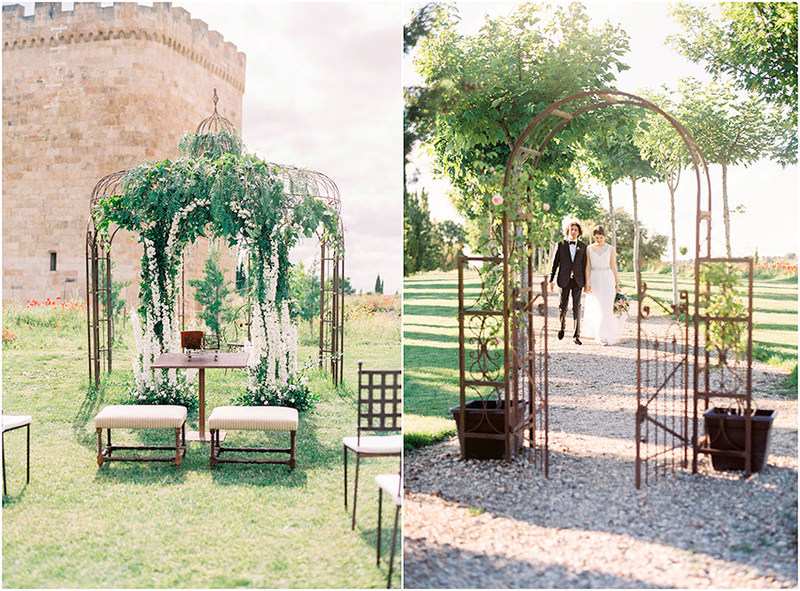 Small destination weddings offer a more personal experience for both the couple and the guests. You will be celebrating only with your nearest and dearest, and you will not have to feel obliged to invite people you are not as close to. Additionally, you can spend more time with each of your guests which makes their time more enjoyable too. For small destination weddings you have a lot more options for venue and accommodation at your disposal. Additionally, it will be a lot easier to accommodate your guests all in the same place. 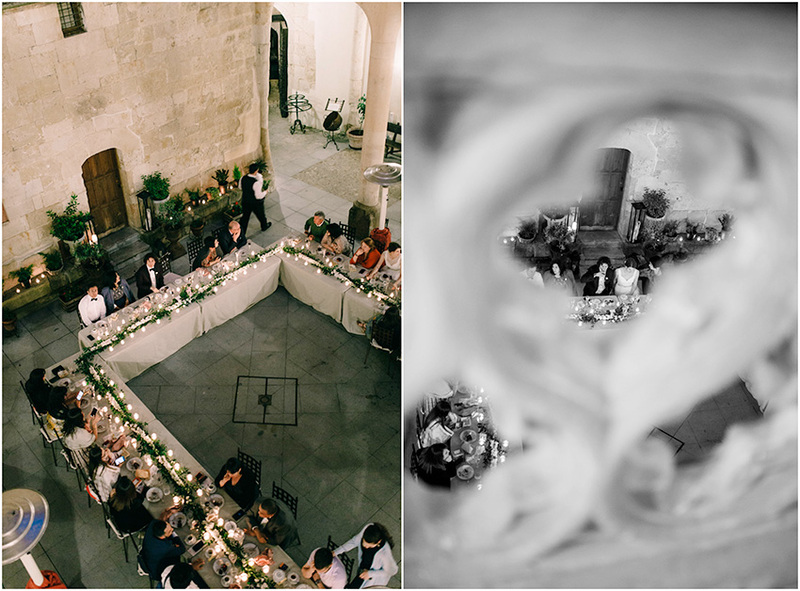 Moreover, you can often accommodate at the same place as the reception. This is generally the preferred option as it cuts down the need for extra transportation. 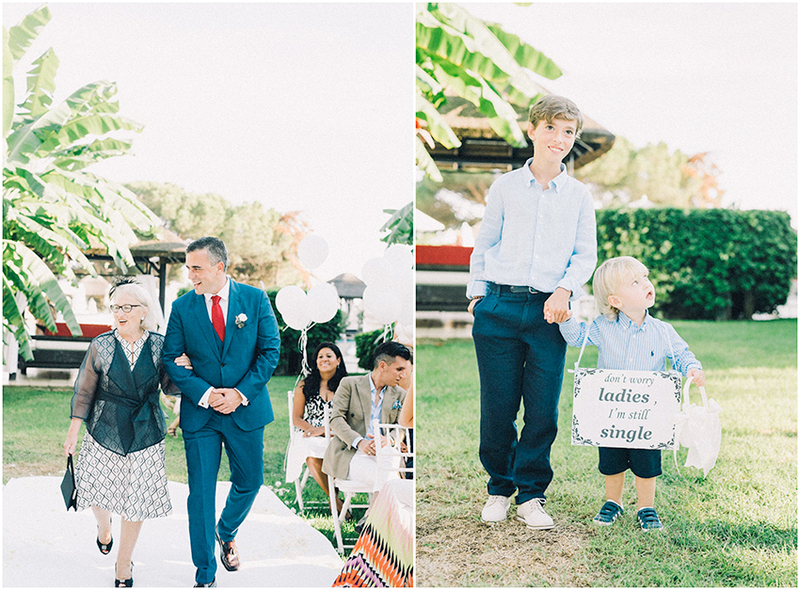 If you opt for a small wedding in Spain, you will tend to spend a long weekend there, or even a week! This will mean that you can spend quality time with your closest friends and family. 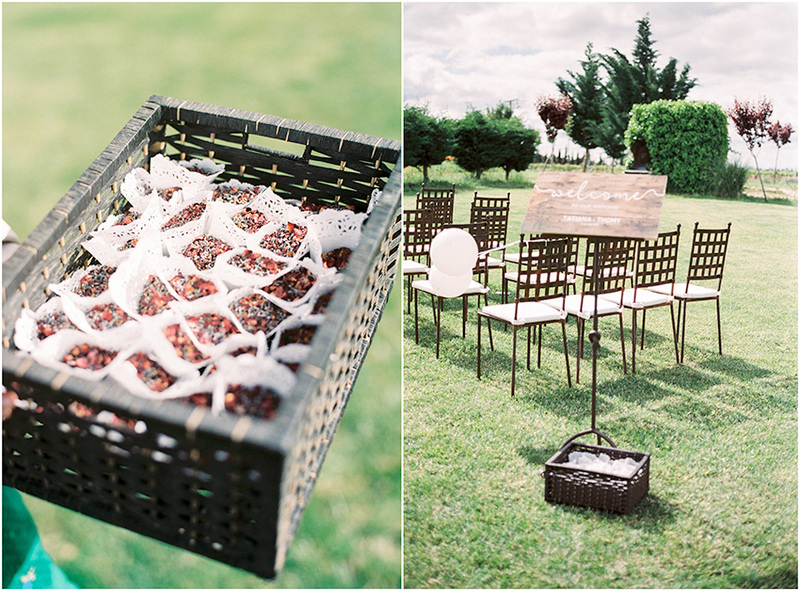 More over, doing unforgettable activities to make your wedding even more special. 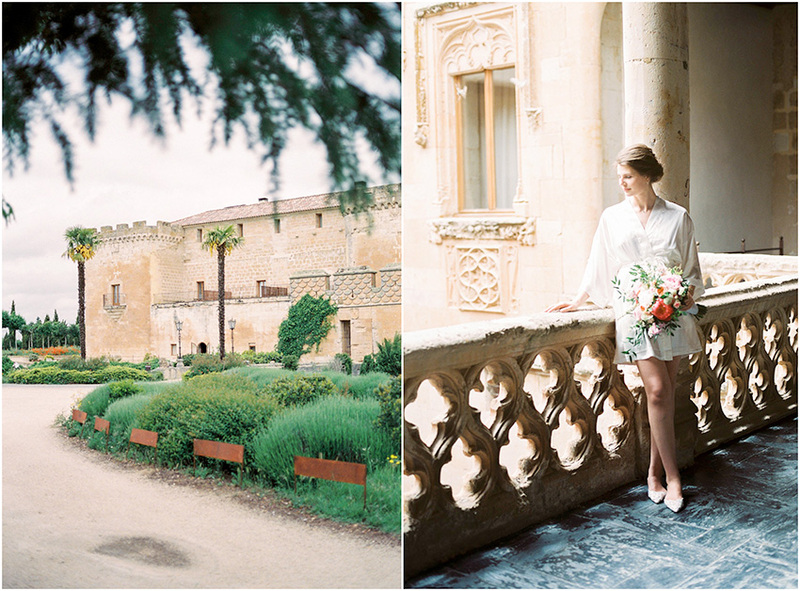 If you want more information about small destination weddings in Spain, you can write to use at info@svadbavispanii.ru. Transport is a very important feature of any wedding, and traditionally the most common choice was of course classic wedding cars. 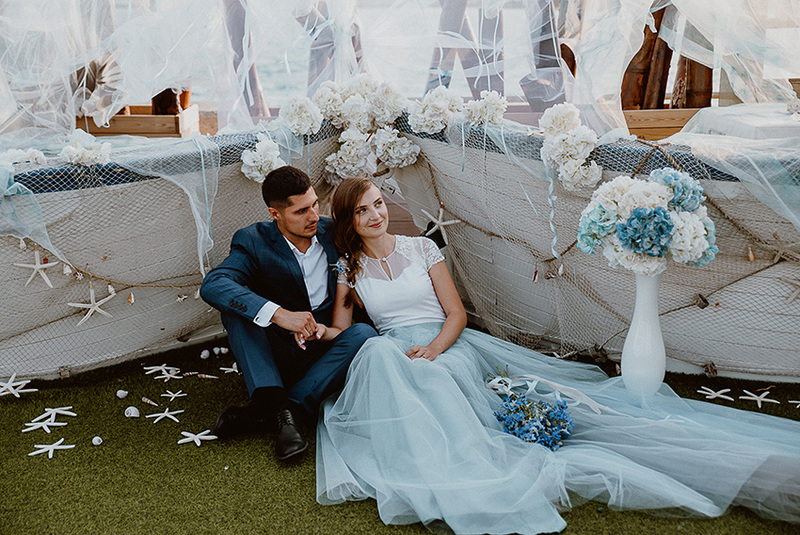 However nowadays there are plenty of options of transport for weddings, so if you’re currently thinking about transport for your wedding this article is a must-read as we have put together the 10 best wedding transport ideas! Let’s start with a traditional mode of wedding transport. 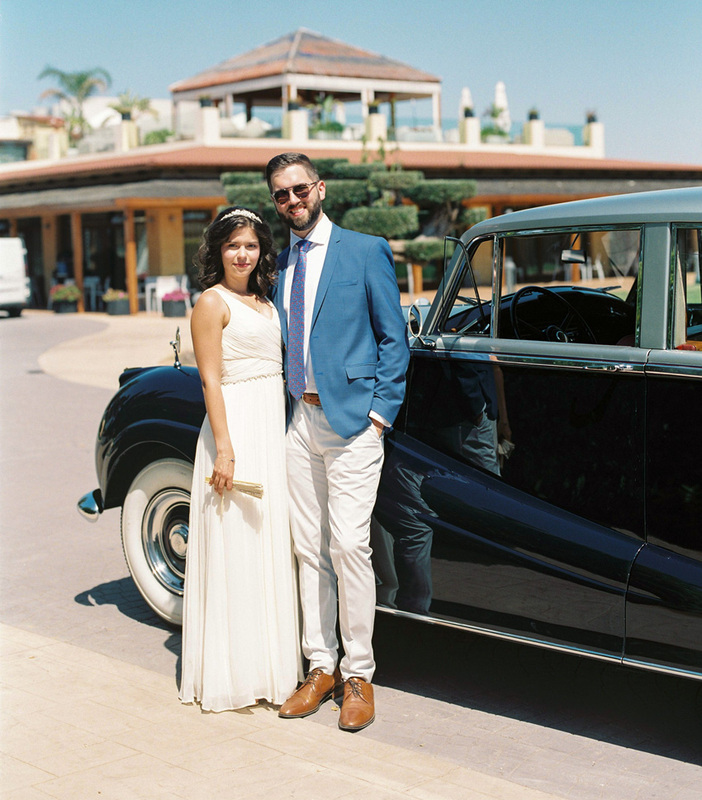 Classic cars have always been a popular choice for weddings, and if you love the beauty of classic cars this option is perfect for you. There is a whole host of models to choose, and it is popular to decorate the car with ribbons to transform it into a wedding car. Limos are linked to luxury and glamour, so if your wedding is going to be luxurious and glamorous, why not travel by limo? Additionally, from a more practical point of view, if the bride has a large, princess-style wedding dress a limo could be a more comfortable choice since the dress will be able to fit more easily in a limo! If travelling in a supercar is your dream, why not use the opportunity of your wedding to make this dream happen? 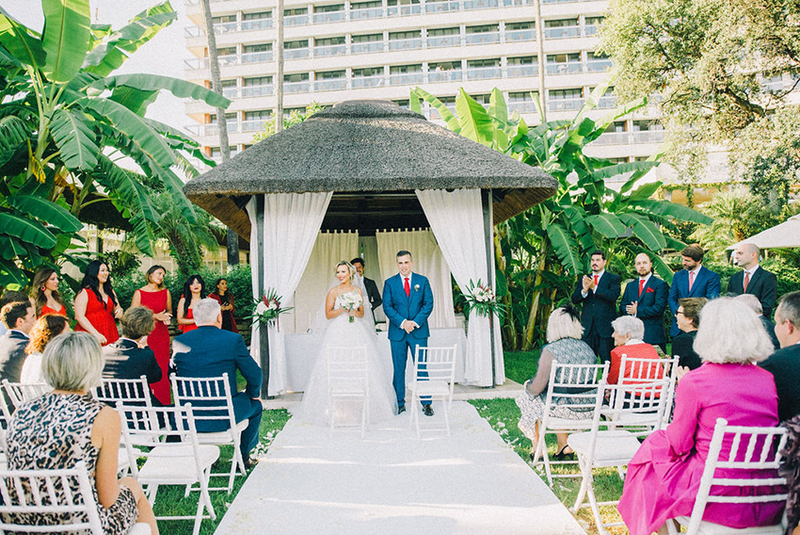 Imagine being transported from your wedding to the reception in a chic red Ferrari with the roof down with the Spanish sun beaming down on you – perfect. If you are a king or queen of speed and enjoy being in the open air, a moped (such as a classic vespa) or motorbike (Harley Davidsons always look cool) could be the option for you. It’s certainly a unique choice and would definitely be unforgettable. On the opposite end of the spectrum to motorbikes lies the elegant option of a horse and carriage. 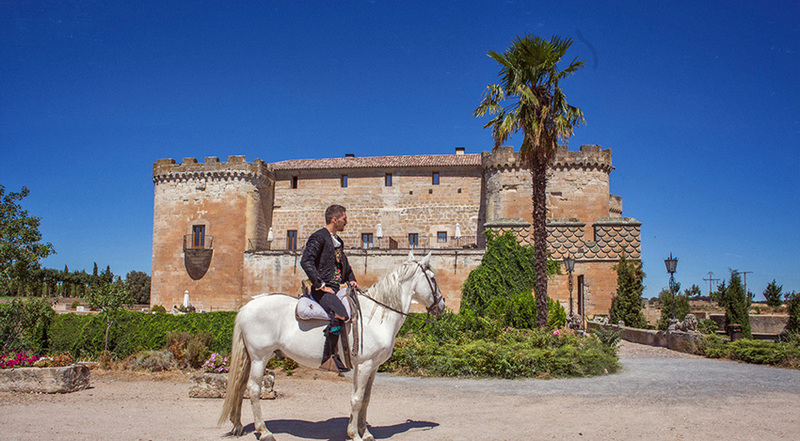 With Spain’s beautiful, sunny climate, a horse and carriage is a very feasible option. 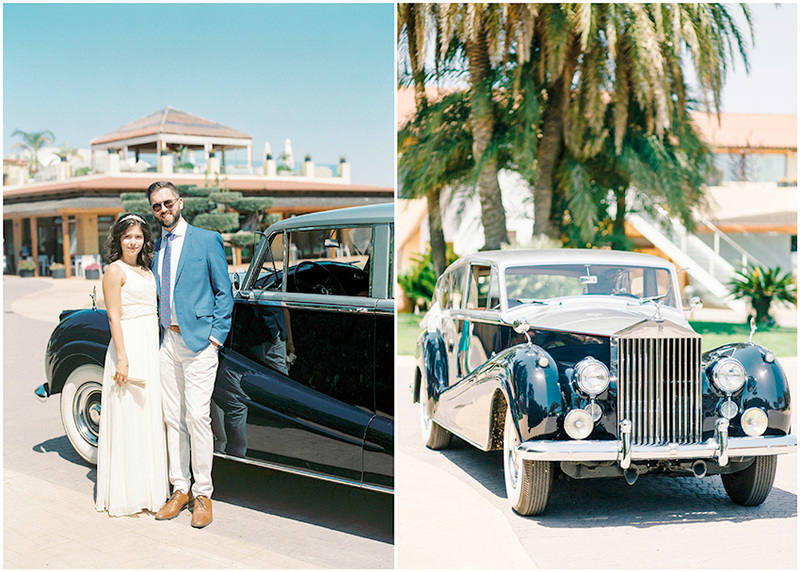 This method of transport will make you feel like a king or queen on your wedding day. If you are marrying in Catalonia, why not use the cultural Catalan symbol of the donkey? As well as being sweet animals, donkeys have also provided a reliable method of transport for thousands of years. 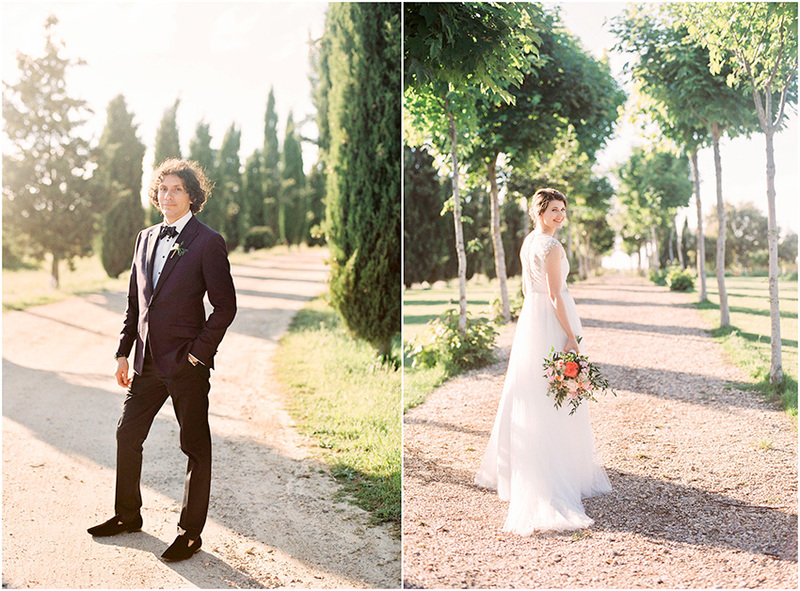 To make an unforgettable entrance, you could arrive at your wedding in a helicopter or even by a small private plane. 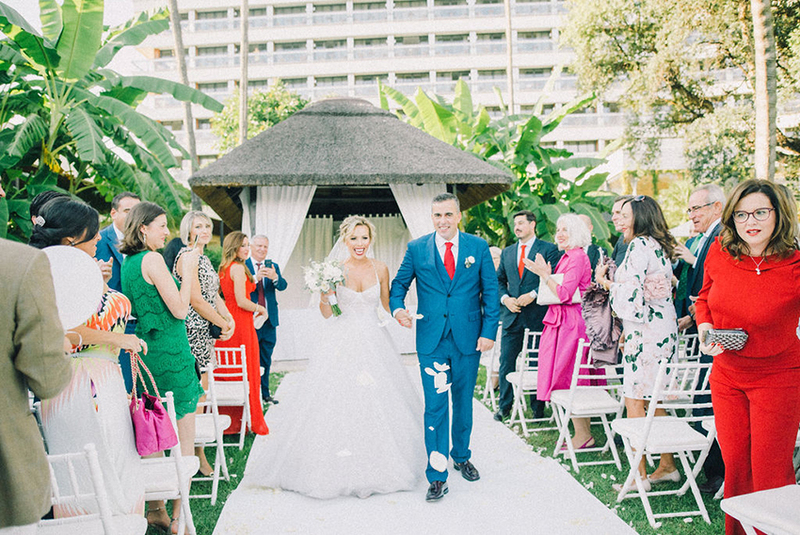 Imagine rolling out the red carpet from a helicopter to walk down the aisle! You’d feel like royalty. Again arriving from the sky, if you are a thrill seeker you could choose a hot air balloon to take in all the views of sunny Spain whilst arriving at your special ceremony. 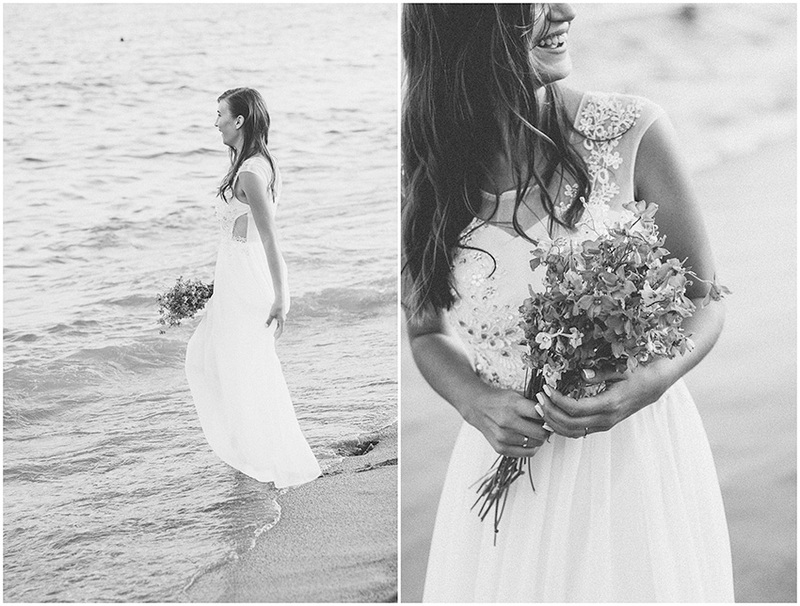 Spain is surrounded by beautiful coastline, and so a popular choice of wedding venue in Spain is the beach. 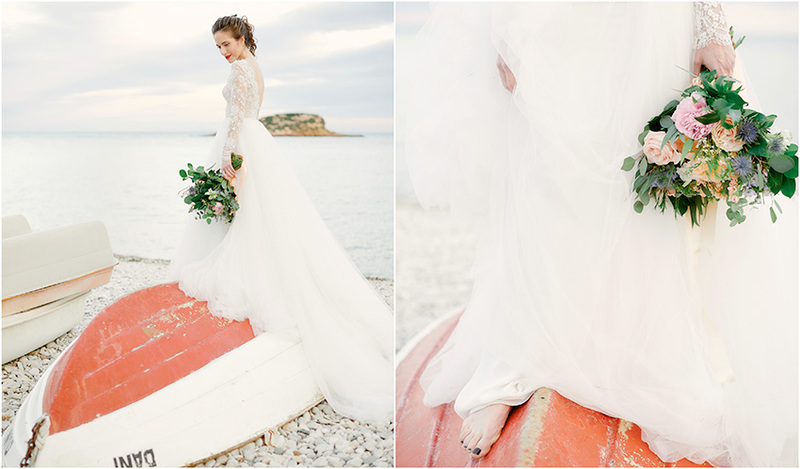 If you are a couple who will celebrate your wedding on a beach, why not consider a boat for your method of transport? It would be both practical as you’re by the sea and unique! 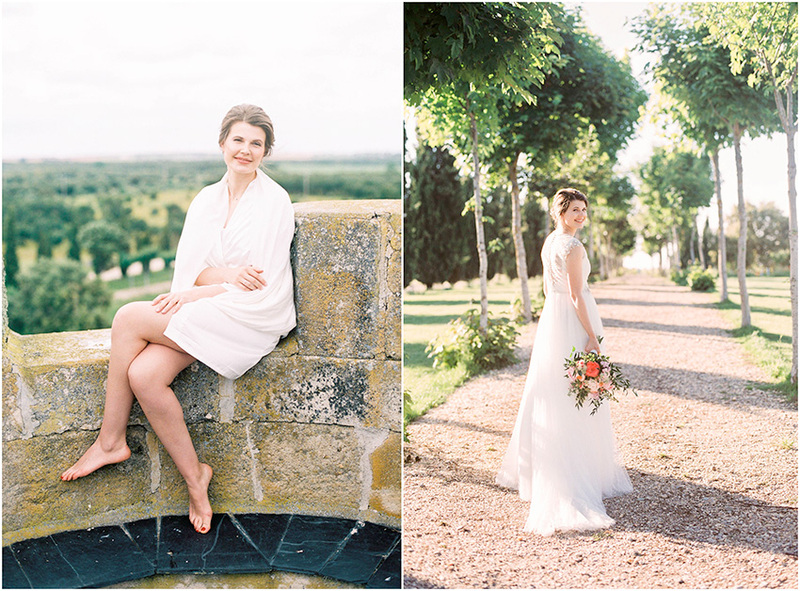 If you are looking to have a simplistic wedding and are not all about fancy transport, walking could be for you. Just ensure that you’re not having to walk too far to arrive at your wedding as we don’t want you to be tired! 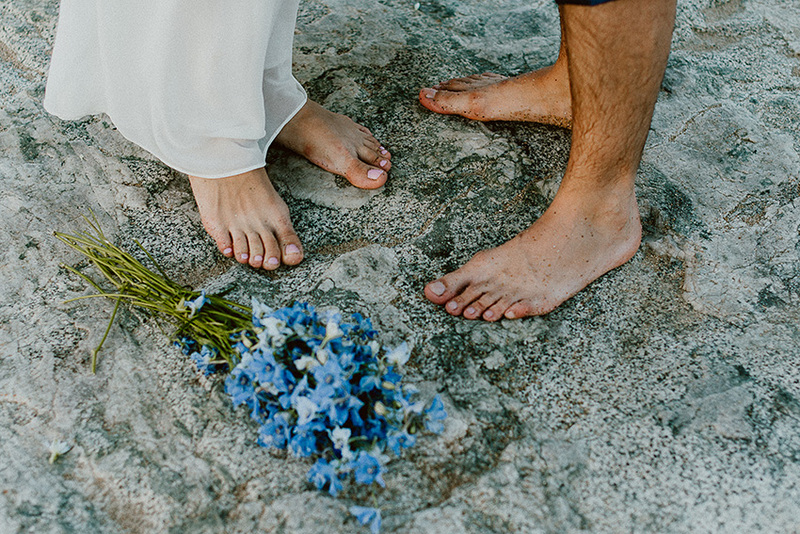 Also consider what shoes you’d wear – there’s nothing worse than aching feet, especially when you’ll be doing your all-important first dance in a matter of hours! 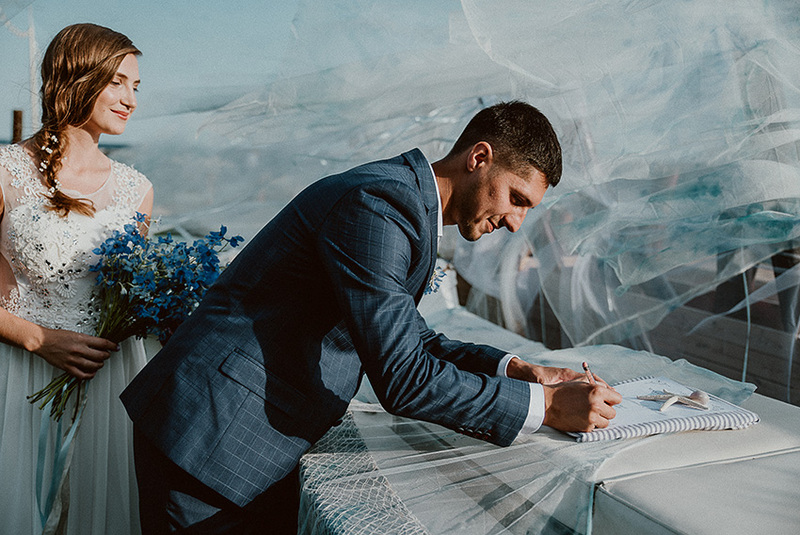 If you want more information on the topic of transport for your wedding, or if you want expert advice and knowledge to help you choose, you can team up with us by contacting info@svadbavispanii.ru. 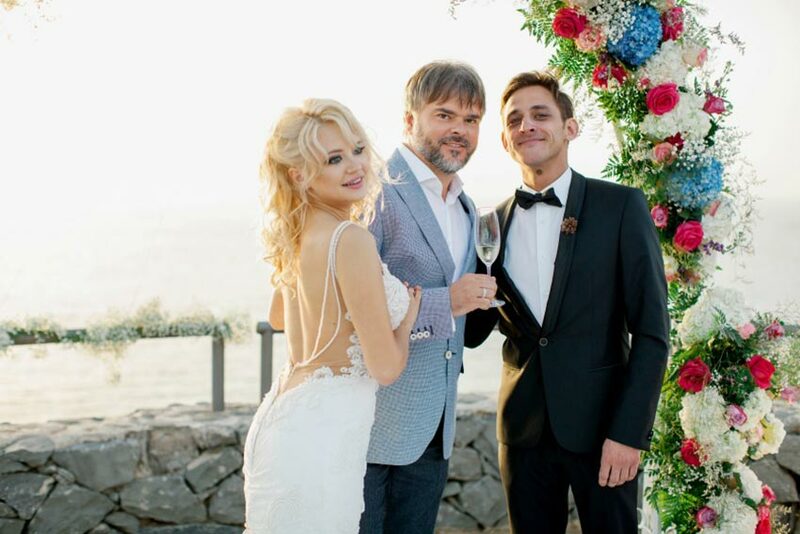 The style of elopement weddings always have a very special romantic air which makes them unique, and Regina and Maksim’s was not an exception. 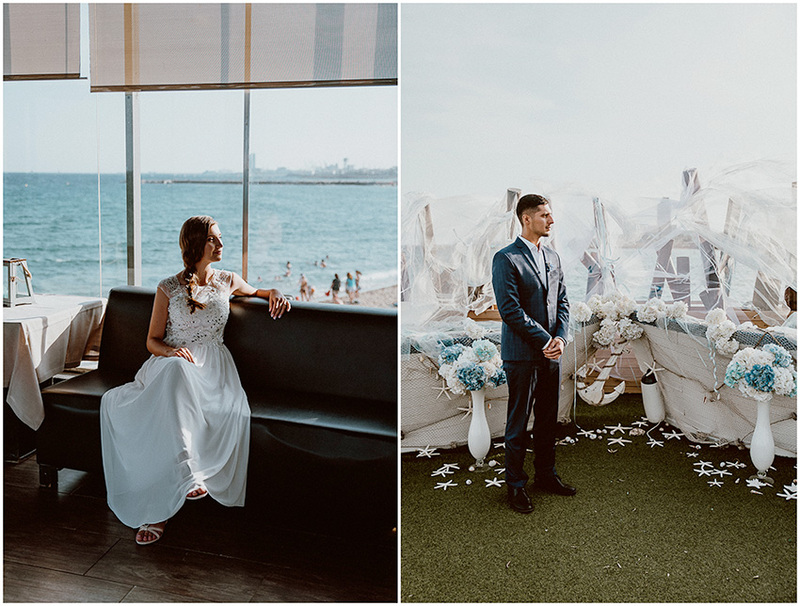 This couple decided to celebrate their elopement in Barcelona, in a spectacular restaurant on the beach with beautiful views and in the marine style they had dreamed of. Regina wore a light dress for the ceremony, with appliqué details, rhinestone and transparencies on the bodice. She wore a youthful side braid and natural makeup with coral-coloured lips, perfect for summer. 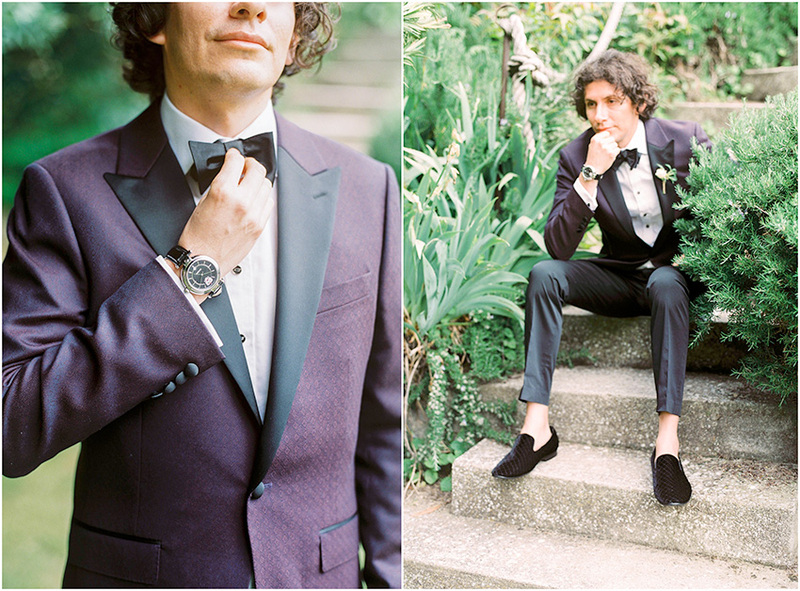 Maksim opted for a blue suit with a checkered jacket and white shirt, which was very elegant. 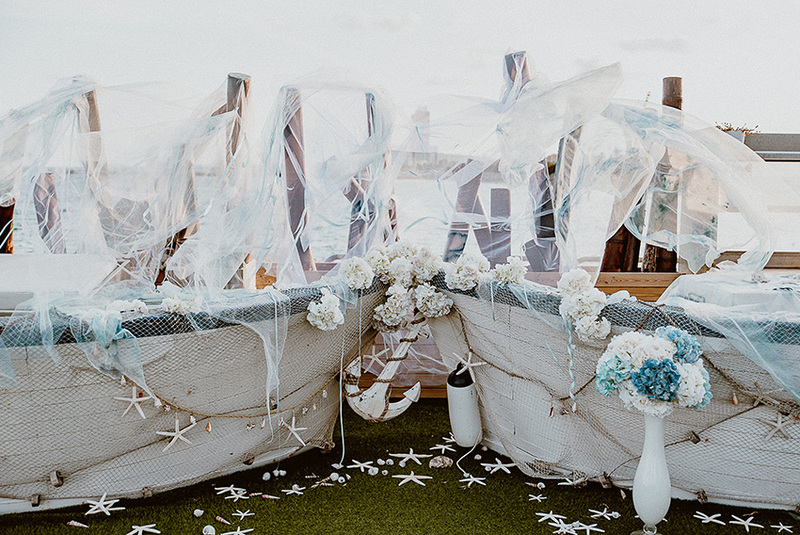 The ceremony decoration was in complete harmony with the landscape as the main elements were from fisherman boats adorned with nets and marine decorations such as anchors, starfish or shells. 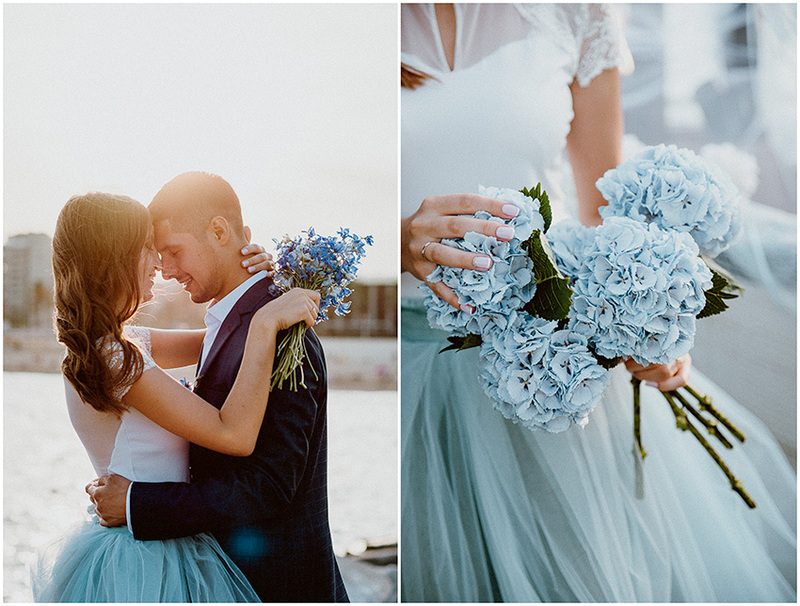 The flowers were in tones of white and blue, to match Regina’s bouquet. 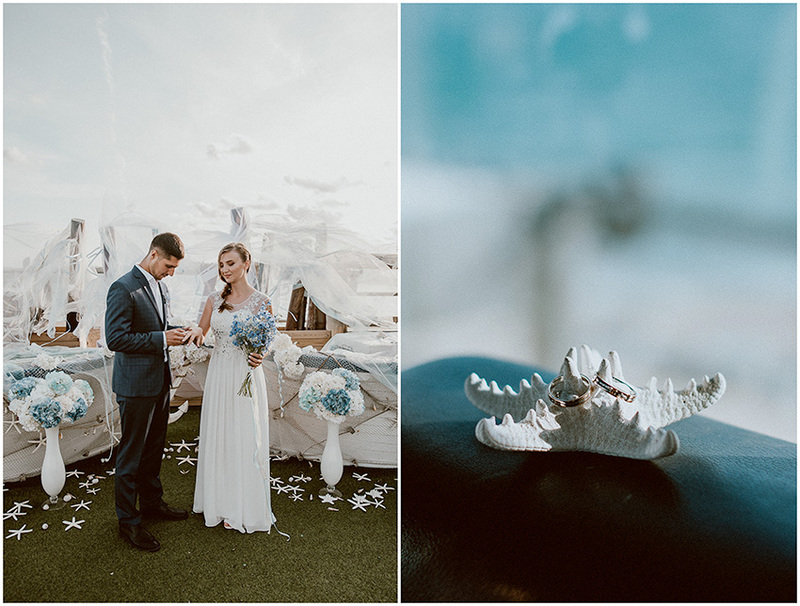 For the photos, the newly weds enjoyed a walk on the beach and rocks, where the bride changed dress and wore a design with a wonderful blue tulle skirt. The result exceeded all expectations and the photos show that. 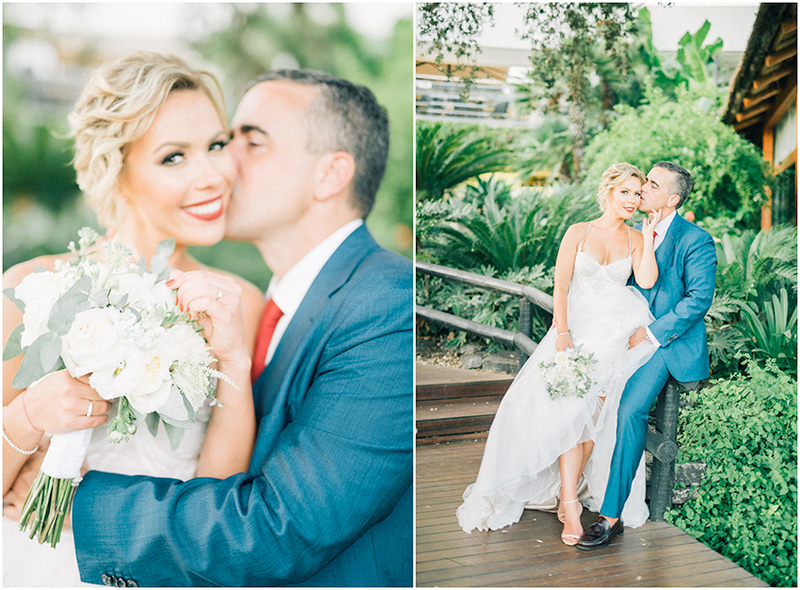 Are you ready to enjoy this elopement in Barcelona? 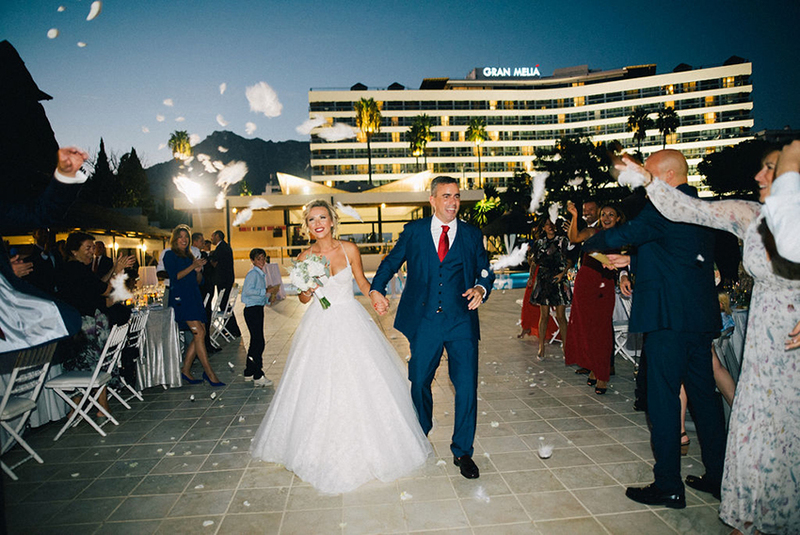 Many couples dream of getting married abroad, but they are put off due to fears of complication and not understanding the necessary processes – however fear no more! 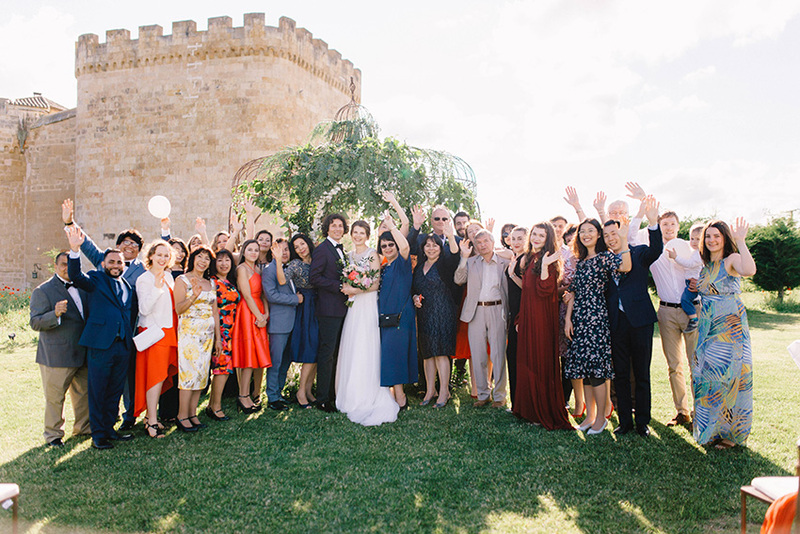 In this post we have selected important information regarding getting married in Spain if you are British to help you feel more prepared for the experience and at Weddings and Events by Natalia Ortiz, we can help you for the whole process. 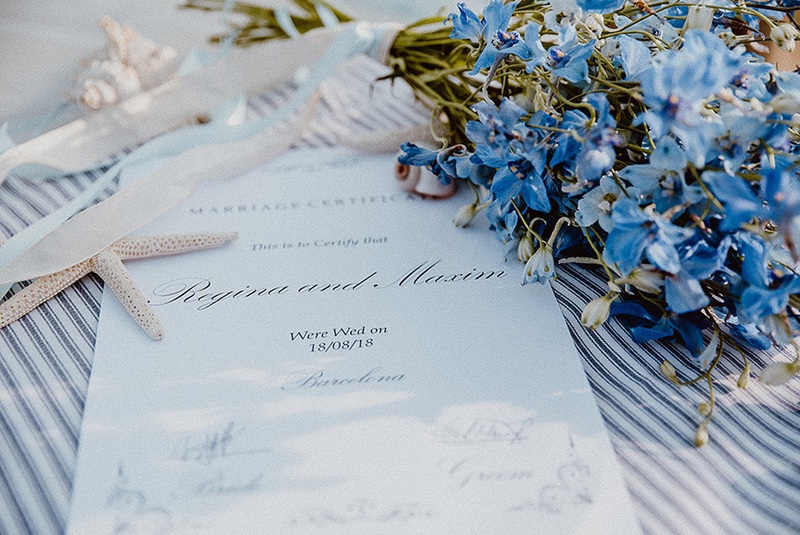 There are a couple of legal requirements for couples to marry in Spain, the first being that both bride and groom must be aged 18 or over, and the couple must not be related. 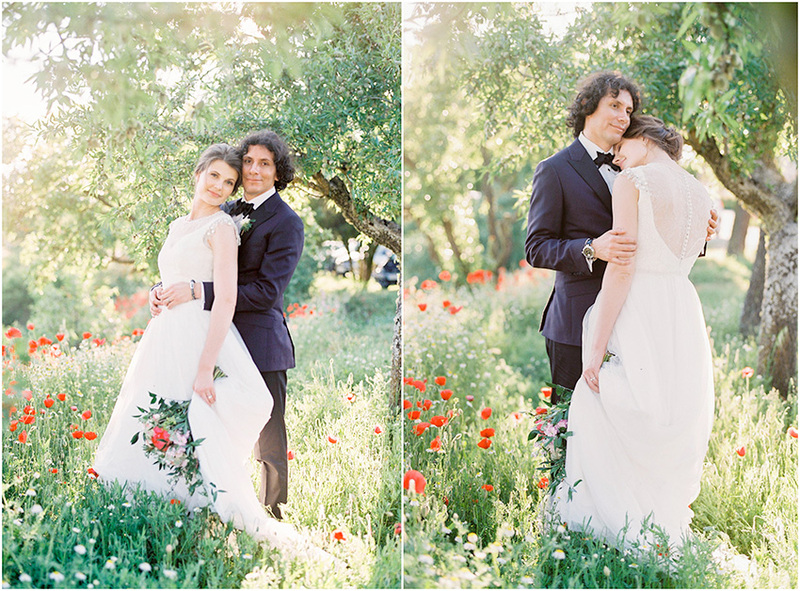 Additionally, it is usually a requirement that either the bride OR the groom (don’t worry, only one of you!) has to have lived in Spain for 2 years. Birth certificate, officially translated into Spanish by a translator who has been approved, and with an apostille stamp. If it is not your first marriage, you need to provide either a divorce certificate or a certificate of death of your previous partner. Please note that these documents are likely to require translation. 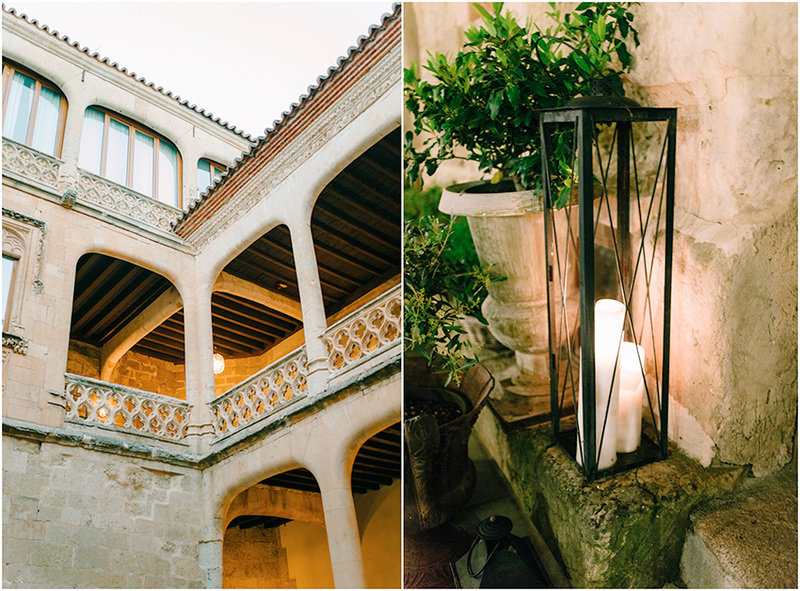 If you are still nervous about the idea of getting married in Spain, let us remind you of the many advantages of doing so. 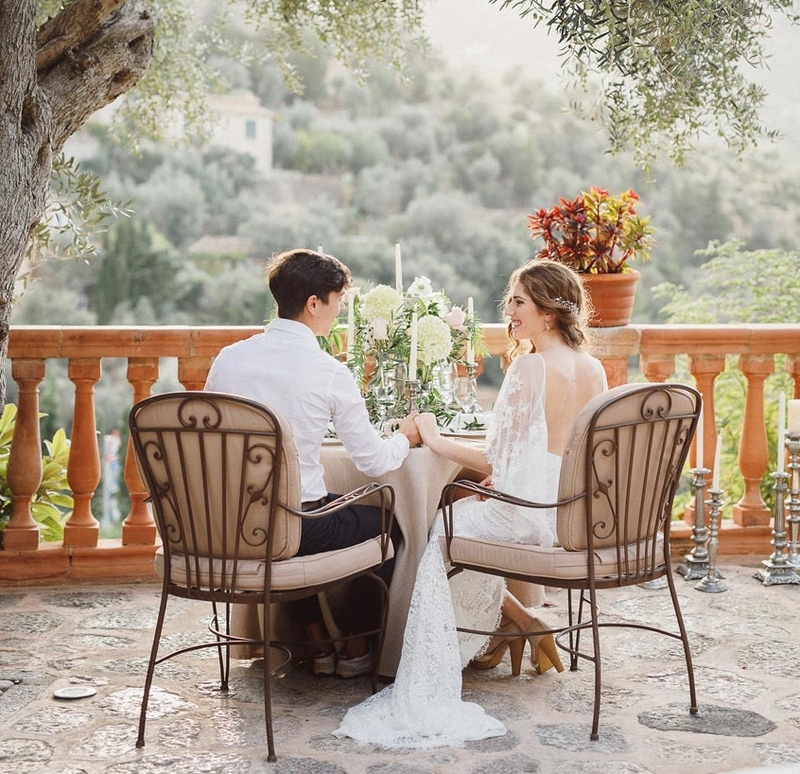 Spain has the advantage of a mild climate all year round, and so you can have more confidence that you will celebrate your wedding in nice weather, which often cannot be guaranteed in Britain!! 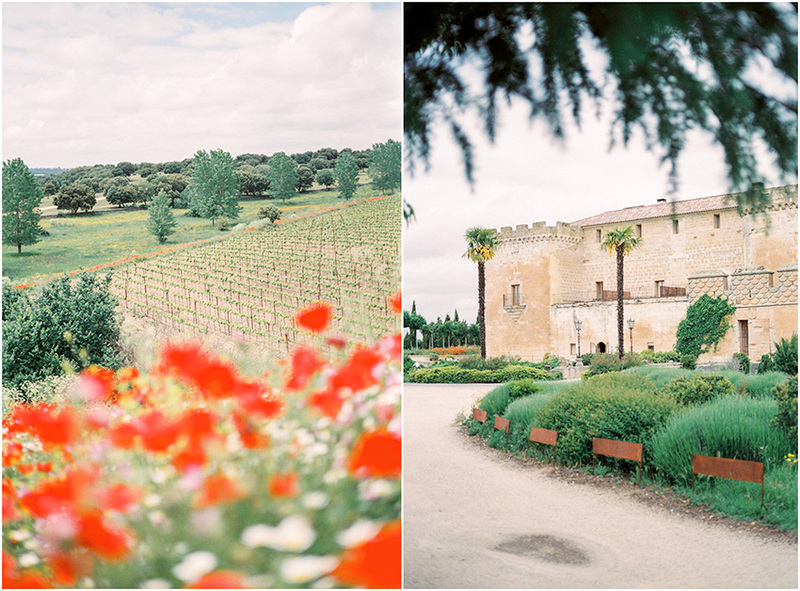 Spain boasts many possibilities of where you can get married. 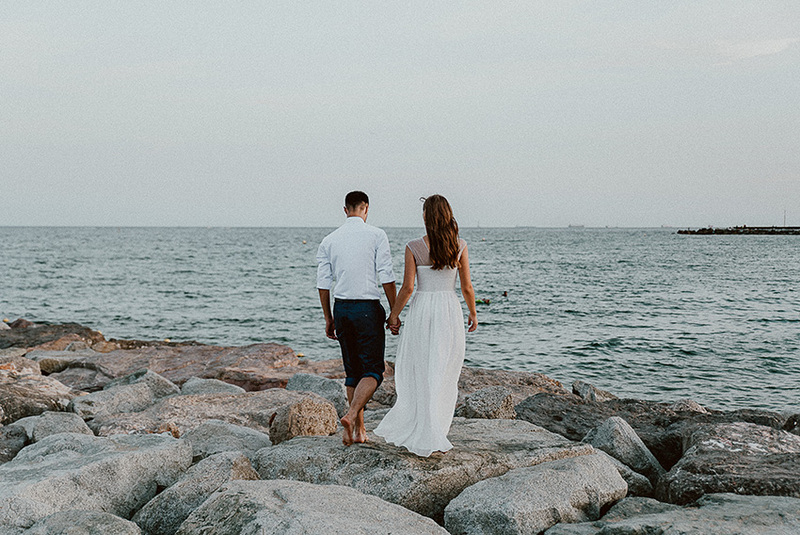 The beaches in Spain are beautiful if you are looking for a beach wedding, but there are also many more options such as getting married in one of the many wonderful, historic churches or in a luxury hotel. In Spain there is a variety of different food types and tastes, from fish to tapas, it has it all! Therefore you can guarantee your guests will be satisfied with the food choices on offer. 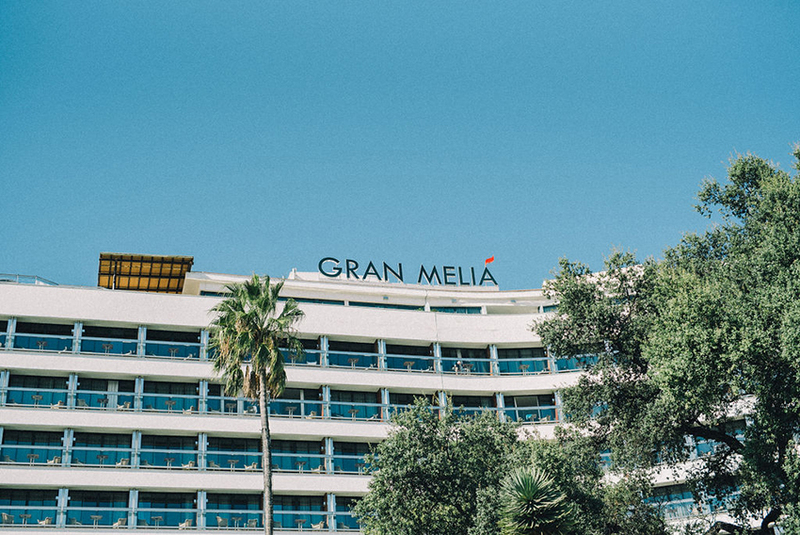 Spain also provides a good option for a honeymoon, so if you get married in Spain you can also spend your honeymoon close by. This is a real advantage as you don’t have to worry about travelling far for your honeymoon as soon as you get married. 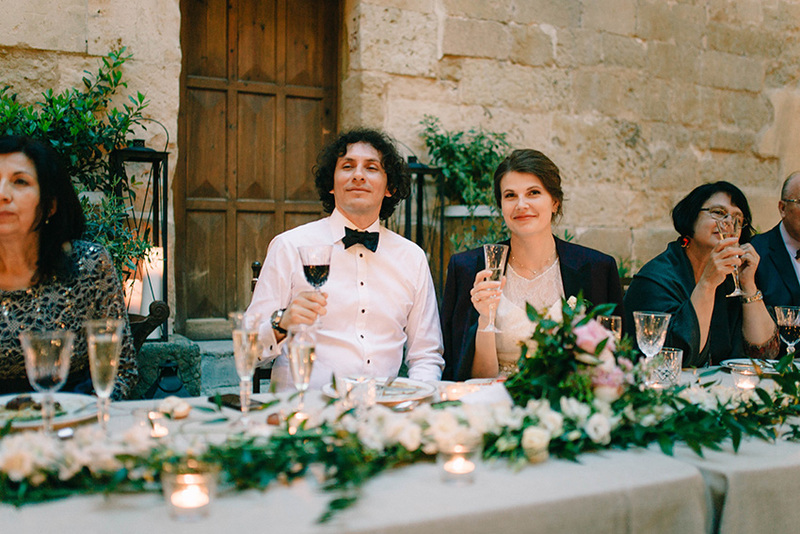 If you wish to know more information about how to get married in Spain if you’re British, or wish to speak to us about the advantages of doing so, you can write to us at: info@svadbavispanii.ru. 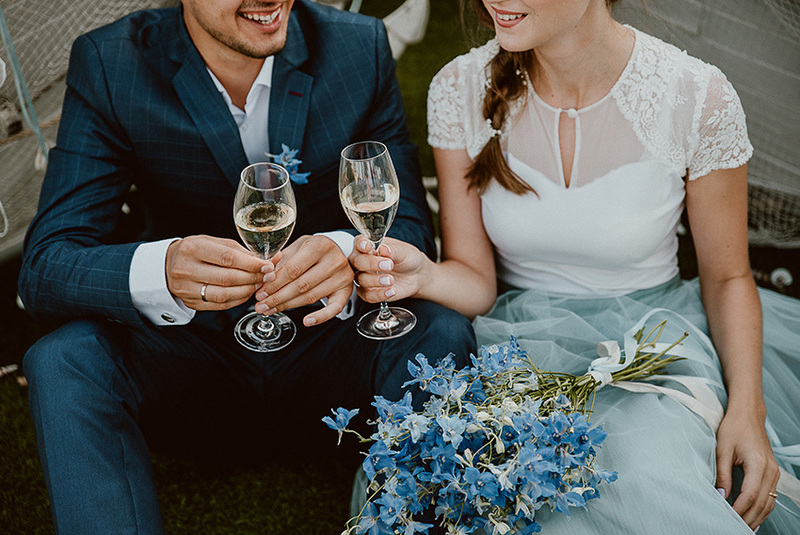 Organising a wedding can be a stressful experience for couples, however hiring a wedding planner is now becoming an increasingly popular choice, as it takes away potential stress and allows you to relax and enjoy the period running up to your wedding. 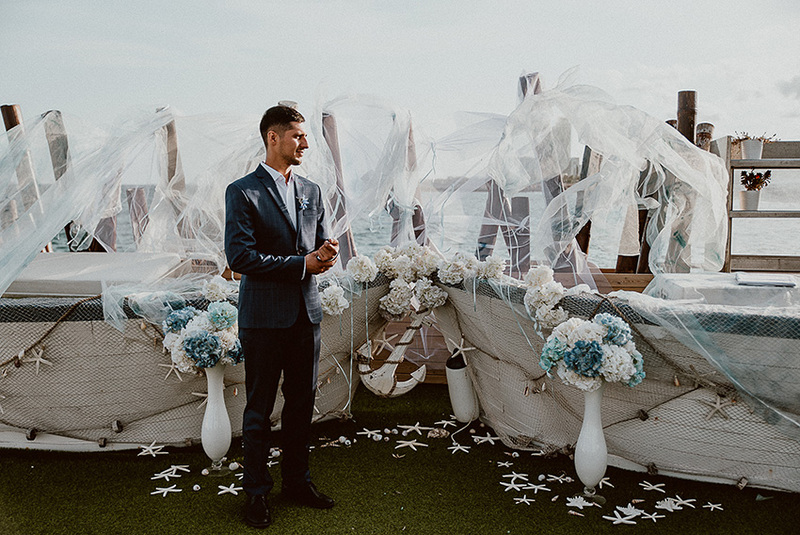 If you are newly engaged and are looking to hire a wedding planner to organise your big day, read this post for useful tips on choosing the right one! It is a good idea to ensure that the planner has extensive knowledge of the country where you want to get married. A planner with this knowledge will know all the best locations and vendors for your wedding to suit your needs! 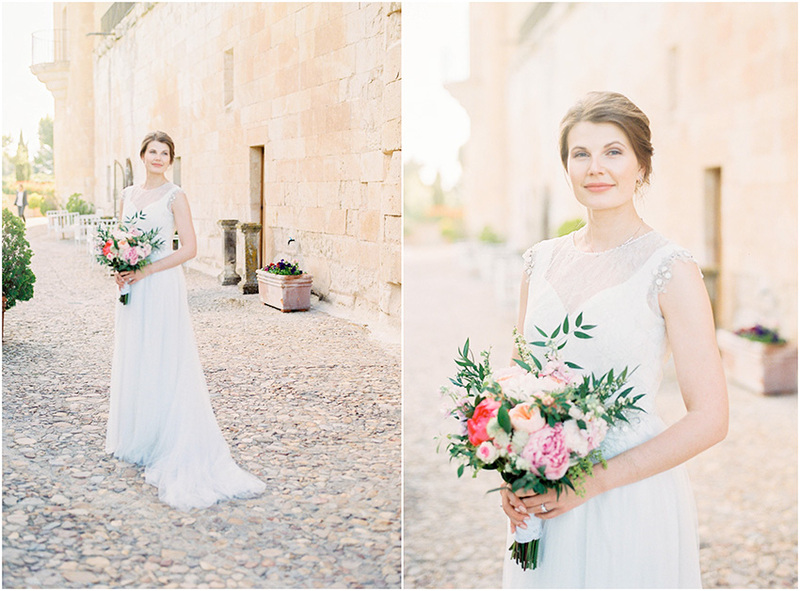 If you are interested in getting married in Spain, our wedding planner has many years’ experience planning fantastic weddings here. 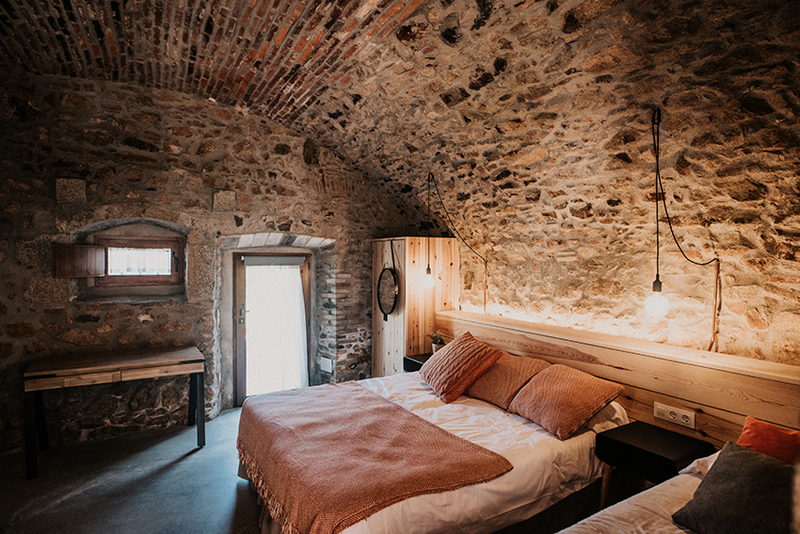 You can see our extensive knowledge of the best locations for weddings in Spain by reading our blogs such as Celebrate your wedding in North of Spain : the charm of the Basque Country & The most breathtaking churches to get married in Spain – and many more! Research the wedding planner on various online platforms, such as a company website and instagram. 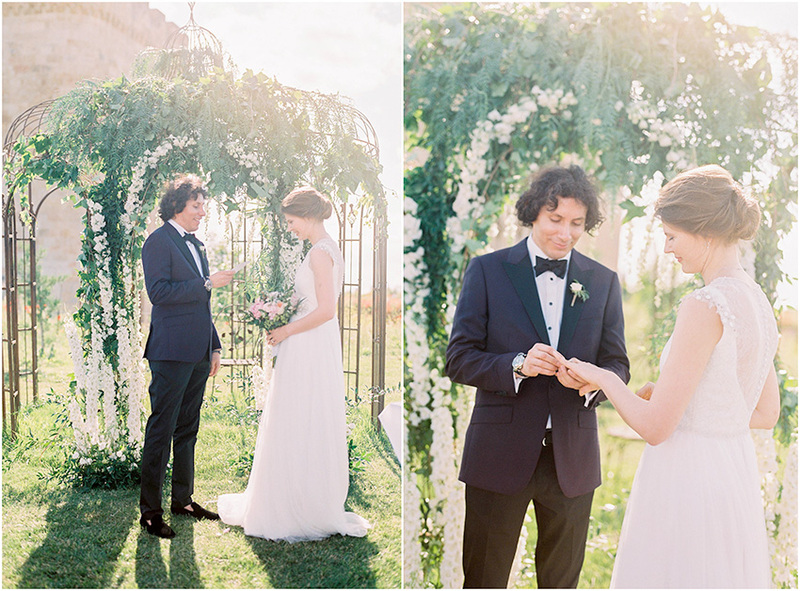 If they can be trusted, they will include examples of weddings they have previously planned. You can look at these images to see if you like them before you commit to their services! Another advantage of this is that you can be sure that the wedding planner is reputable and trustworthy. You can also check that they carry out their projects from start to finish. It is extremely advisable that your potential wedding planning company can communicate with you in your preferred language. 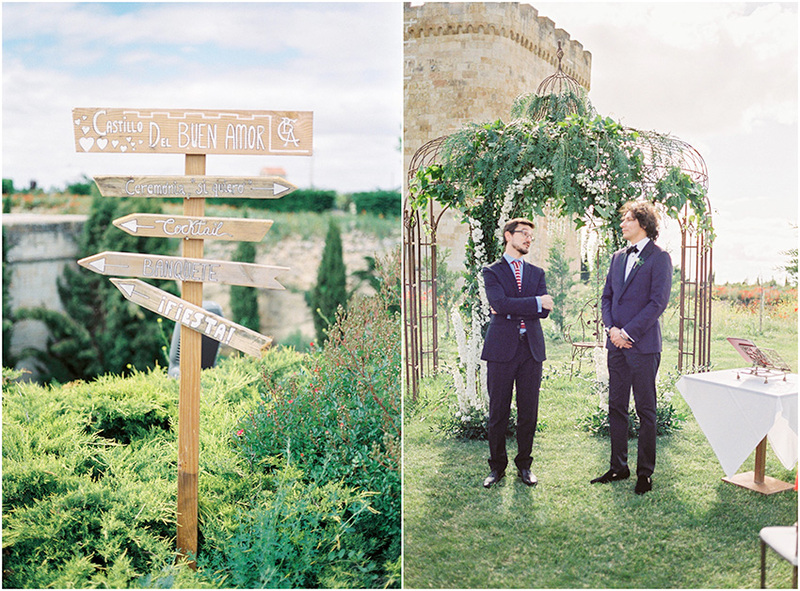 This way you can be sure there will not be any misunderstandings during the organisation of your big day. 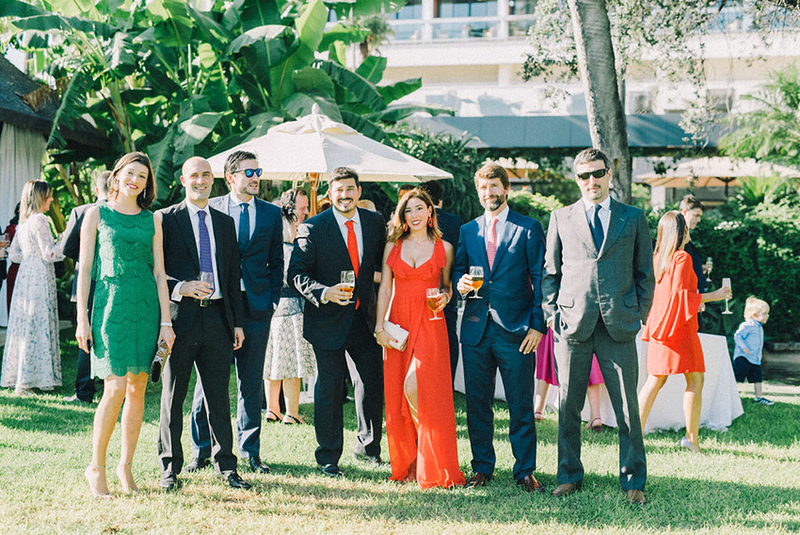 At Weddings and Events by Natalia Ortiz, we have a selection of multilingual employees. This may seem like an obvious point but it is VERY important! To be sure it is not a scam, ensure that contact details are authentic and clearly displayed on the company website. Contact details may include their email address, telephone address and fiscal address. 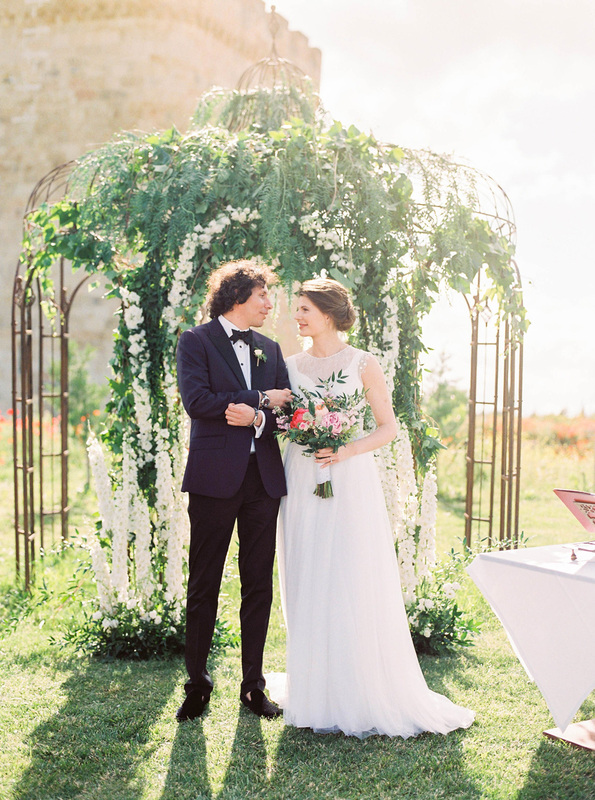 You can find the contact details for our wedding planner here: https://nataliaortizevents.com/contact/. 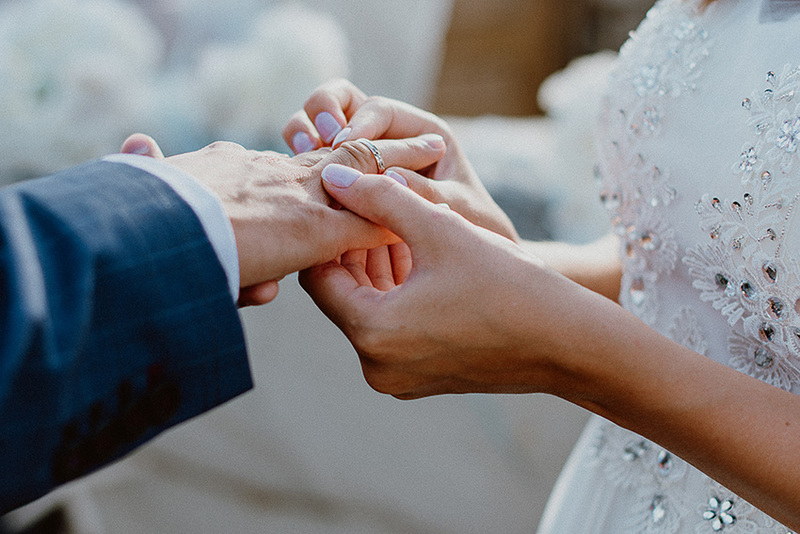 Here are 4 important tips for choosing a wedding planner. 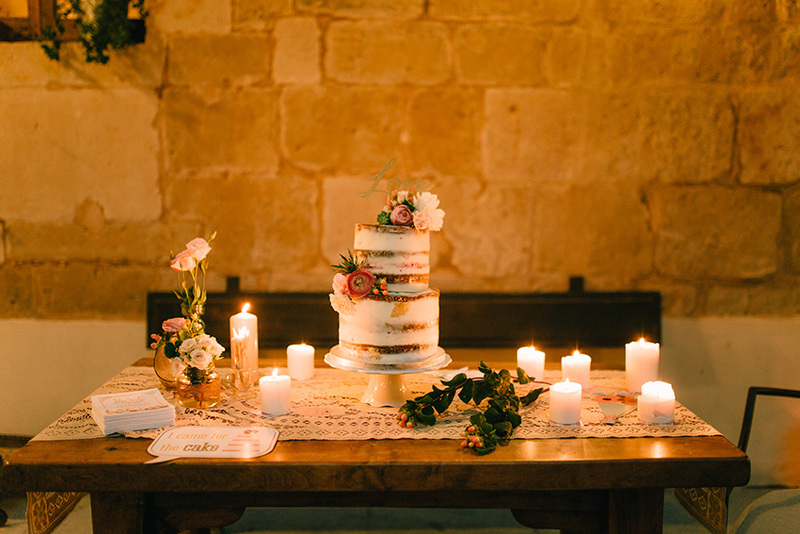 If you are unsure on the advantages of hiring a wedding planner (be sure, there are many!) visit this blog 10 reasons why should hire a wedding planner. 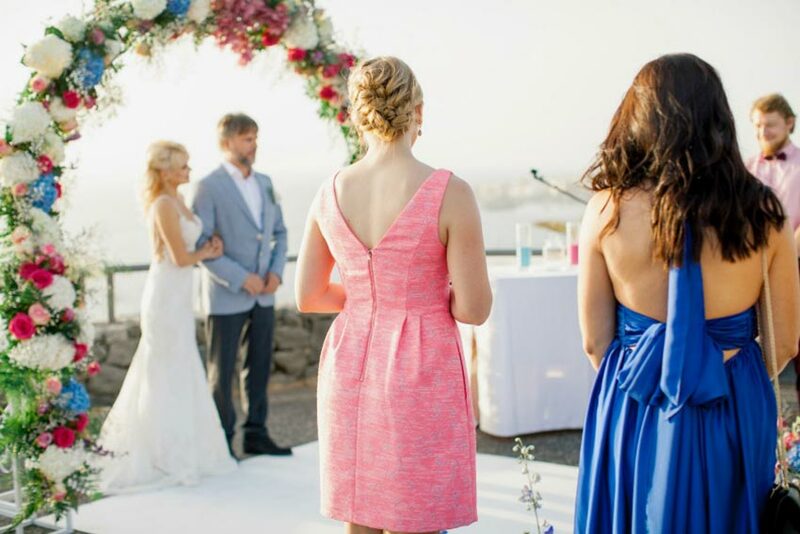 It gives a detailed analysis of why you should hire a wedding planner. If you are interested in our services, you can write to us at: info@svadbavispanii.ru. 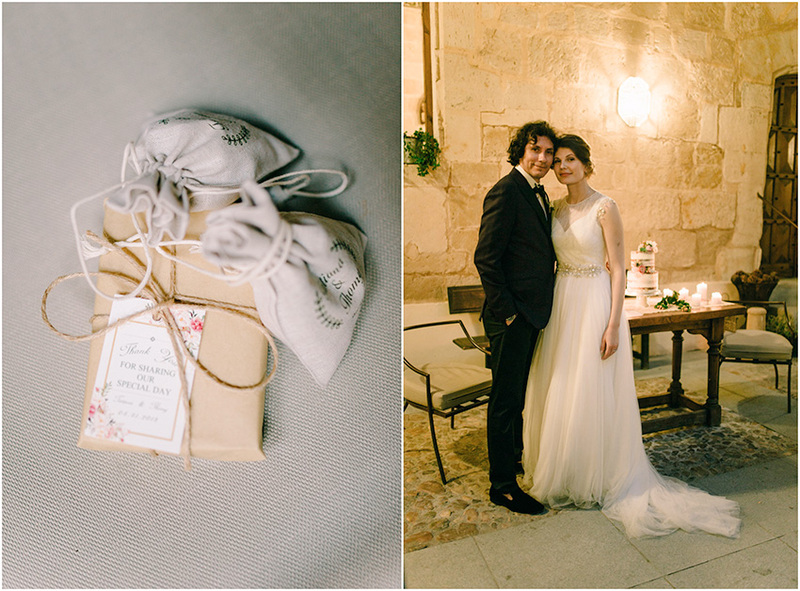 We organized a wedding which took place on the 31st of May in Salamanca for the beautiful couple Tatiana and Thomy. Tatiana is from Russia and she works in finance business and Thomy, from Peru is working as a chef. 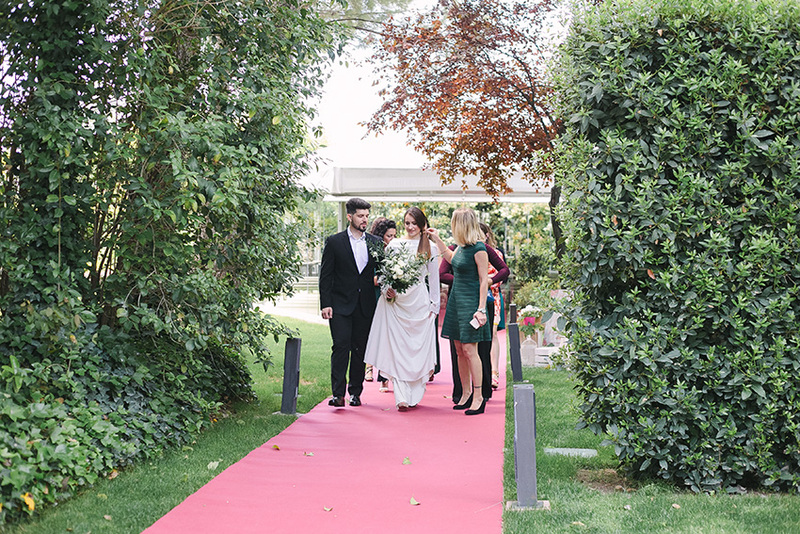 They live in the United States but decided to marry in Spain near to their closest ones so they contacted our office and asked for help in creating the wedding of their dreams. 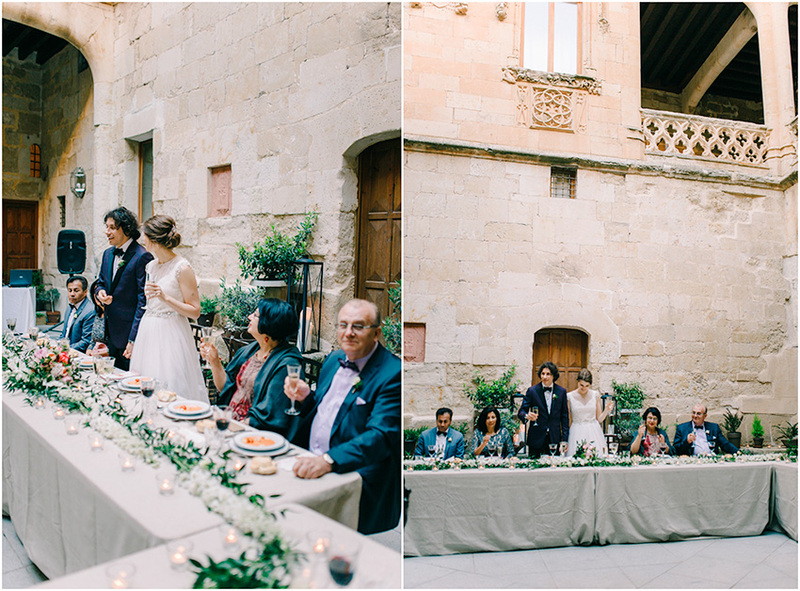 It was a wedding in castle Buen Amor which is a magnificent building with towers and wide gardens where the ceremony took place. 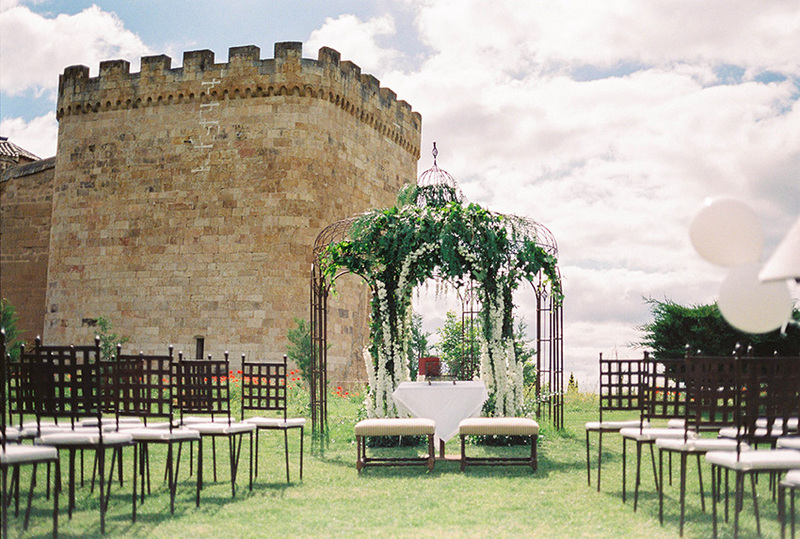 The castle has beautiful iron constructions which we decorated with white flowers and it turned out to be perfect for the romantic ceremony. We also had iron chairs decorated in the same way as the altar and it suited the castle’s medieval style well. 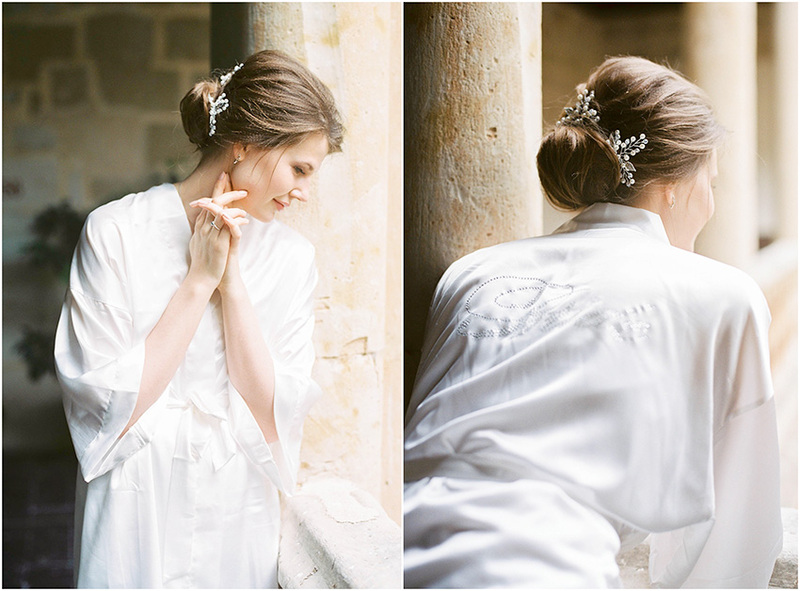 Tatiana was dressed up in the castle and, as you can see from the video, this moment was peaceful and full of happiness; she was like a real princess from a fairytale castle. 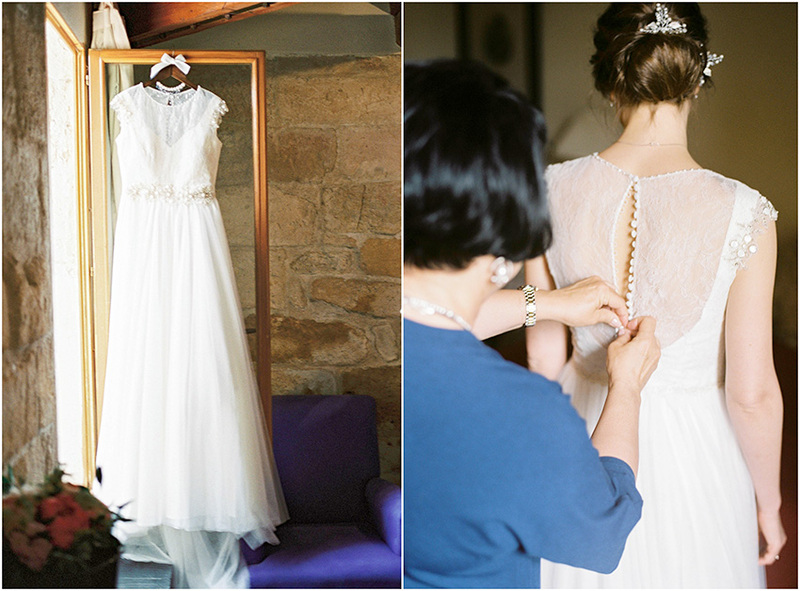 Her wedding dress was light with a beautiful heart shaped neckline and some transparent fabric in it. She also had a belt with decorations and sleeves. It was amazing! 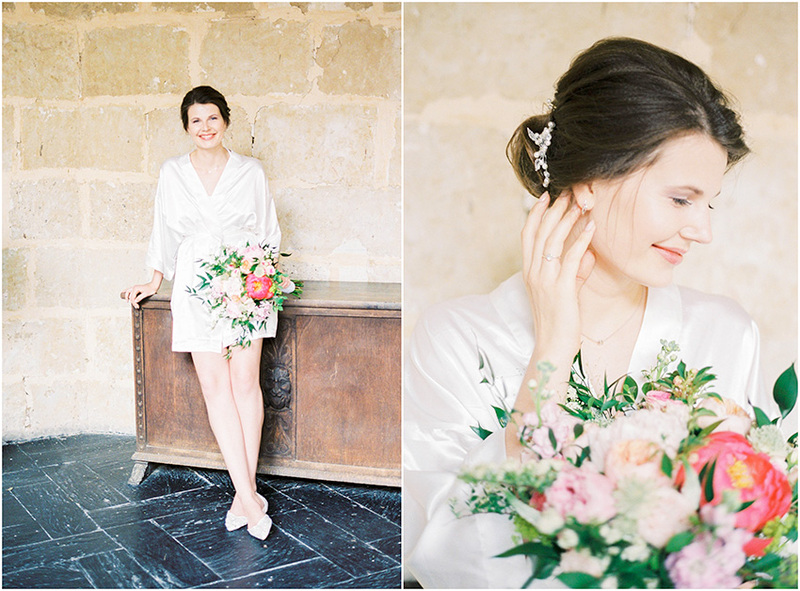 She chose a romantic white and silver hair piece and her wedding bouquet had flowers in pink and mauve colors. 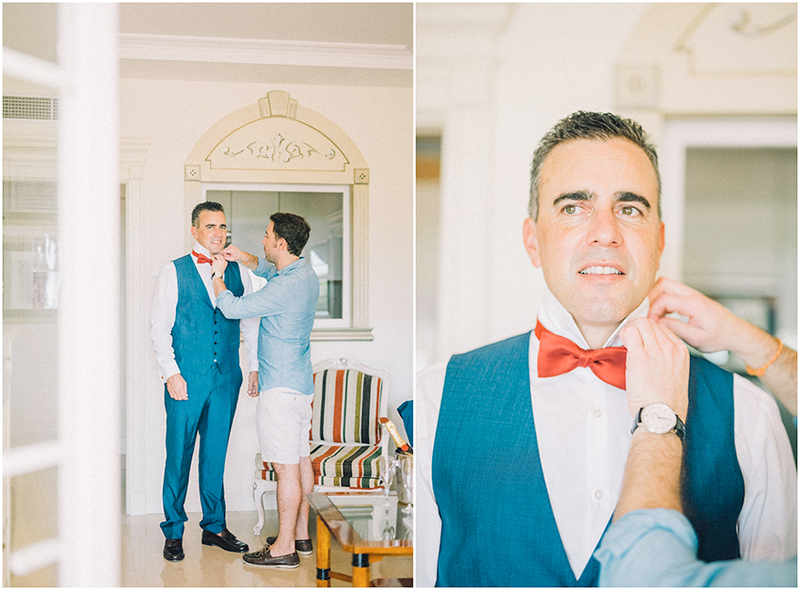 Thomy was wearing a black and blue tuxedo with a white shirt and a bow tie. So the guests knew where the ceremony was, we had wooden signs with white characters. Wooden signs also acted as a beautiful decorations. 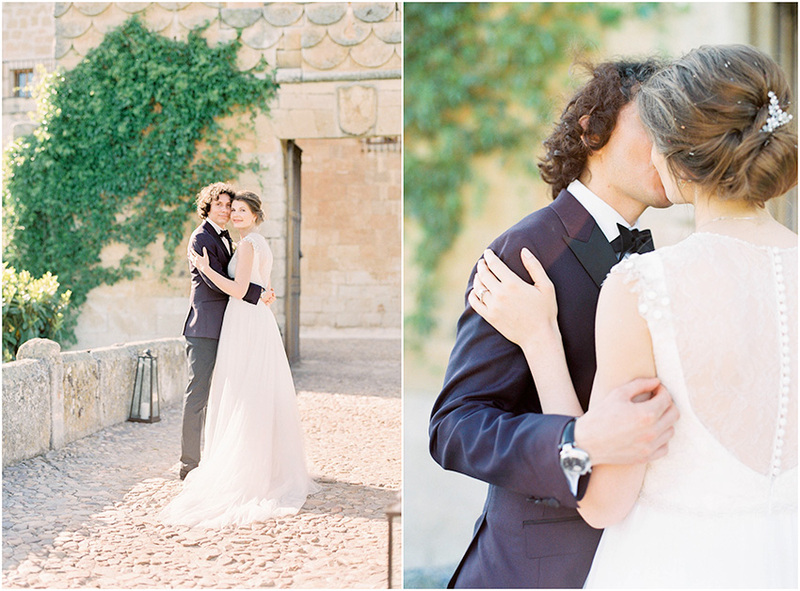 The couple couldn’t have been happier at the end of their wedding in castle Buen Amor, it was exactly what they had been dreaming of.